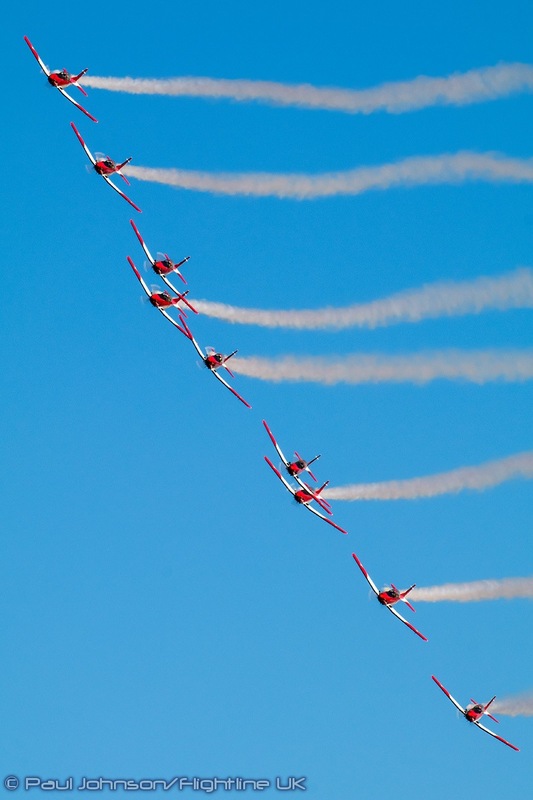 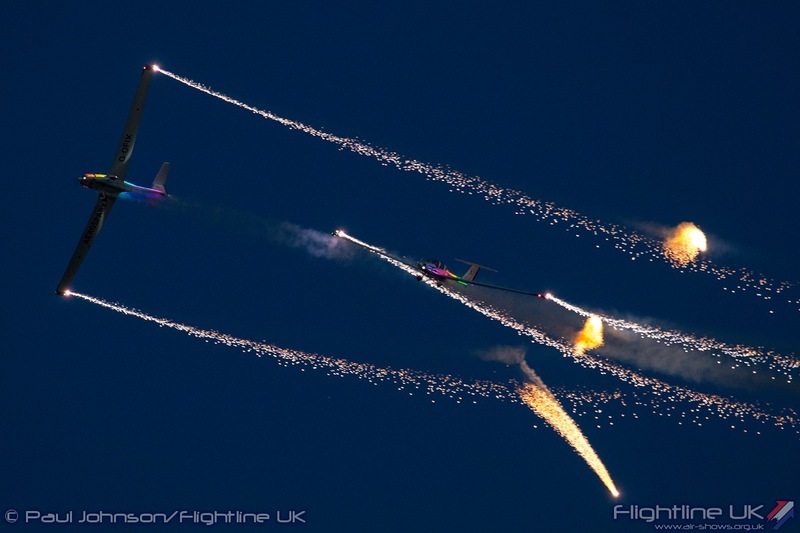 The Sanicole Sunset Airshow is one of the largest events of its kind in Europe. 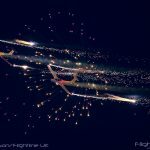 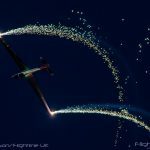 Inspired by the Night Shows regularly seen in the US, it provides a spectacular opening for the International Sanicole Airshow weekend. 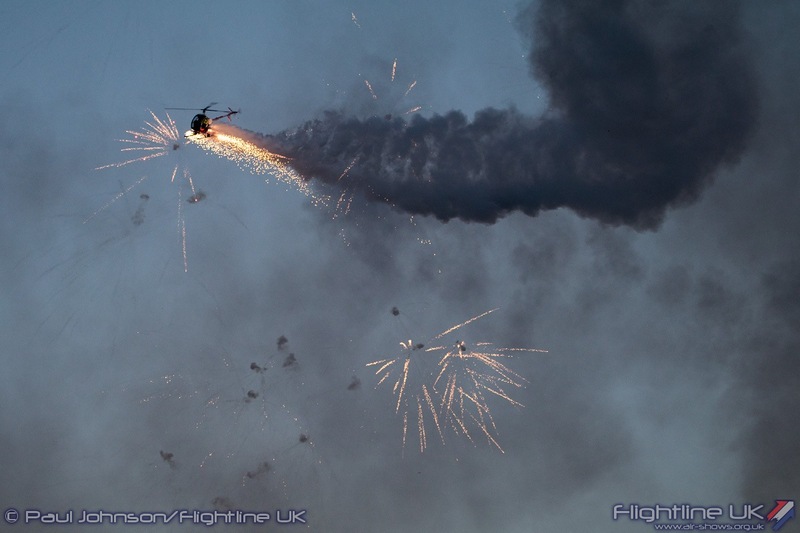 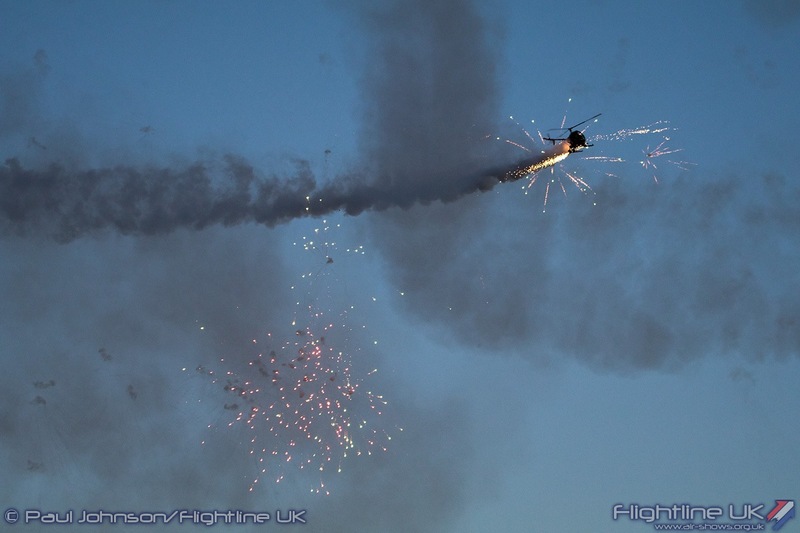 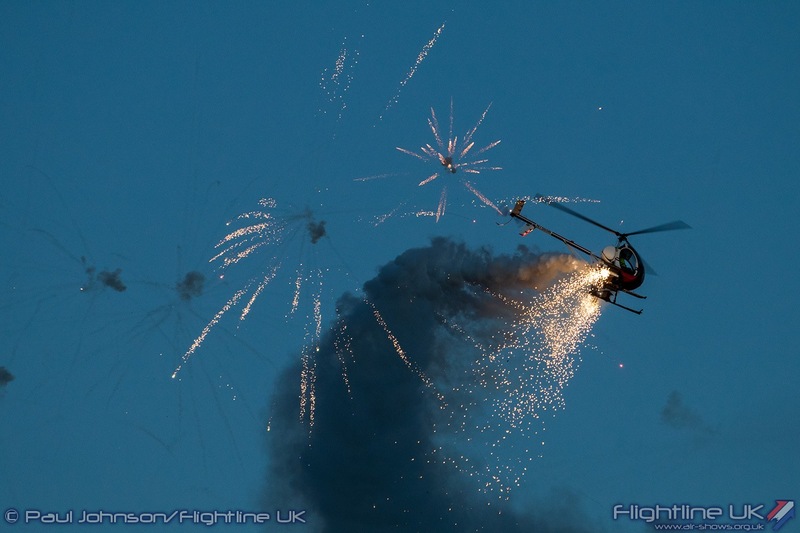 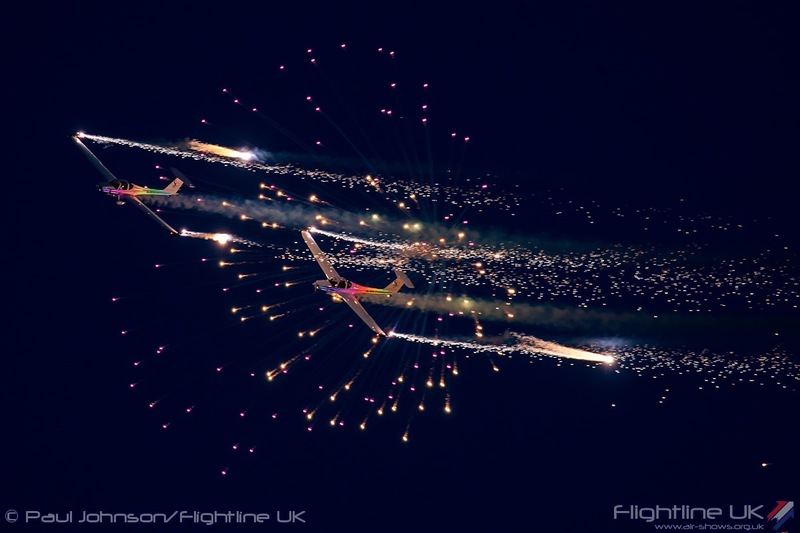 In true Sanicole tradition the show combines an eclectic mix of military and civilian acts closing with specialised pyrotechnic displays and fireworks. 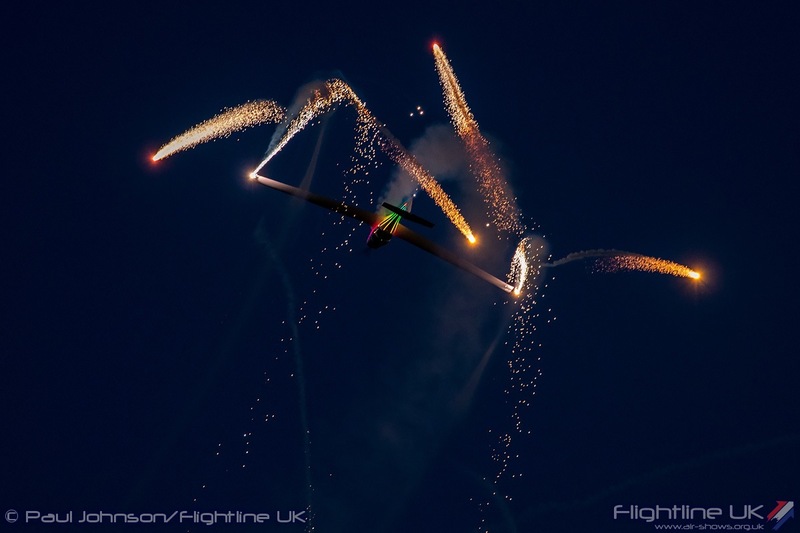 There are few more magical experiences on the air display scene than evening airshows. 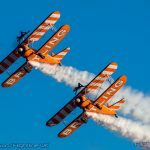 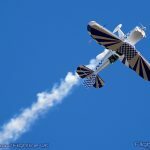 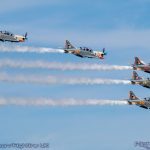 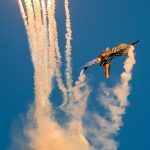 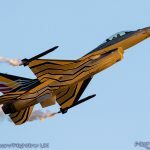 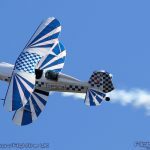 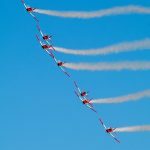 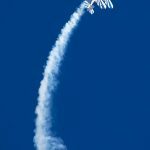 The Sanicole Sunset Airshow is one of the very best and since 2010 has set the benchmark for many of the event around Europe. 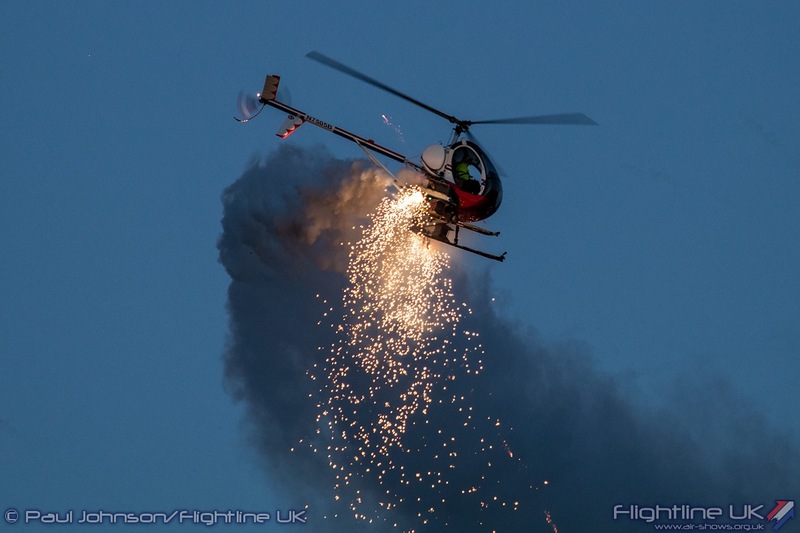 The first Sunset show saw just a handful of pioneering acts perform with pyrotechnics. 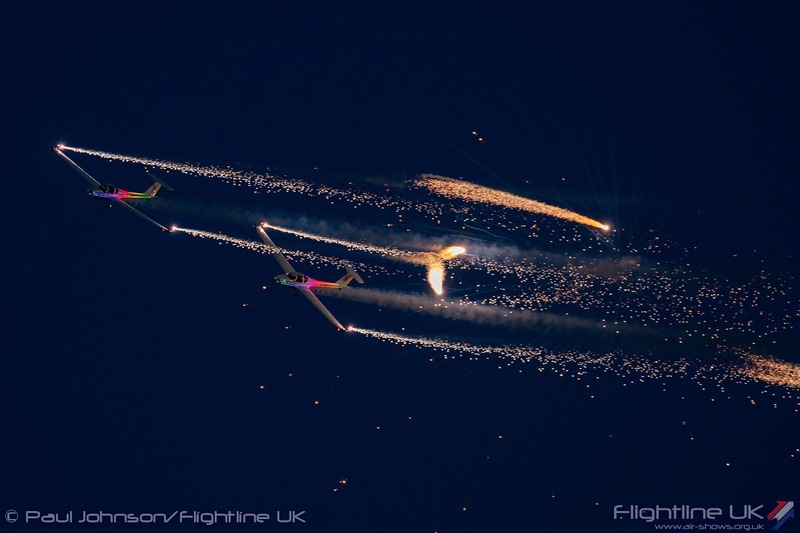 Fast forward to 2016 and there are now many more acts on the circuit offering their own take on “fire and light” shows in the twilight. 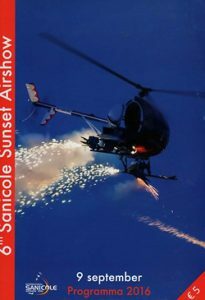 The Sanicole Sunset Show starts at 6pm, just as the sunlight starts to set a golden glow across the Belgian countryside. 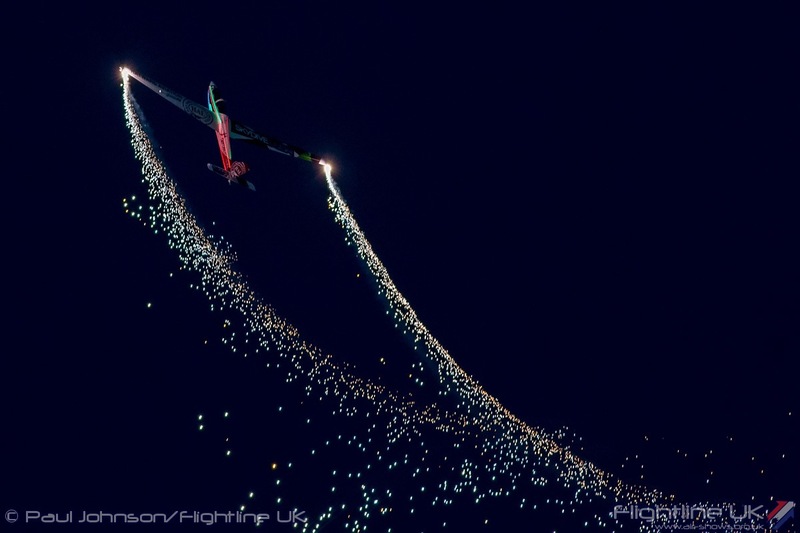 It is a true “In-to-the-night” event with continuous action until the final rays of sunlight have disappeared. 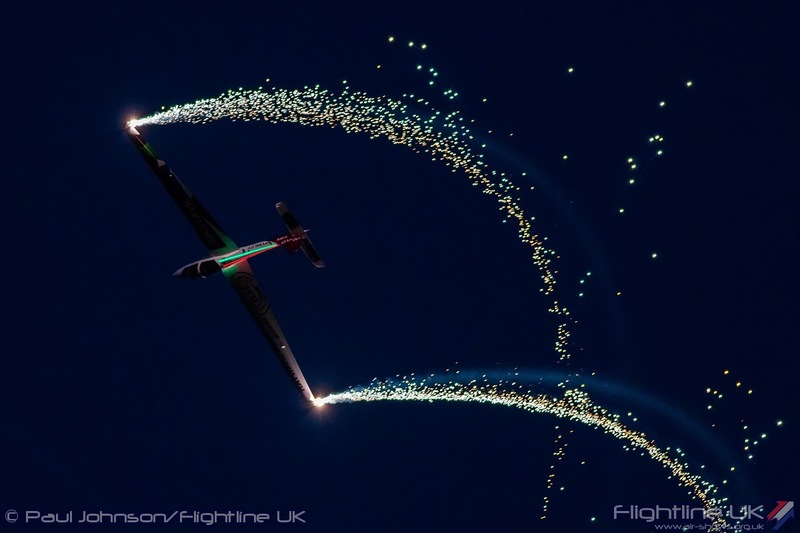 It is more than just an air display, it is an experience for the senses too with many of the displays set to music. 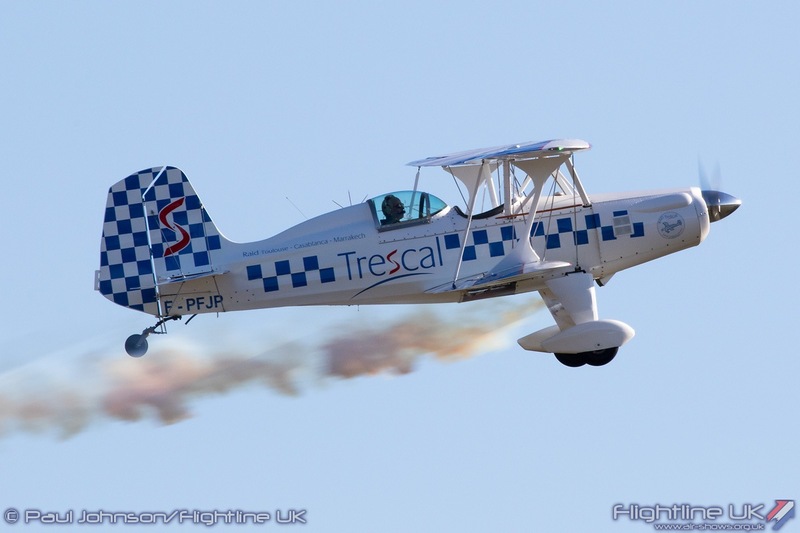 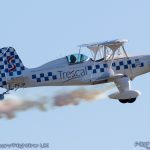 Opening the show was Trescal sponsored Stolp Starduster Too providing to gentle aerobatics to open the event. 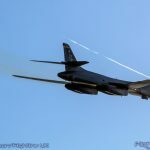 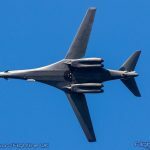 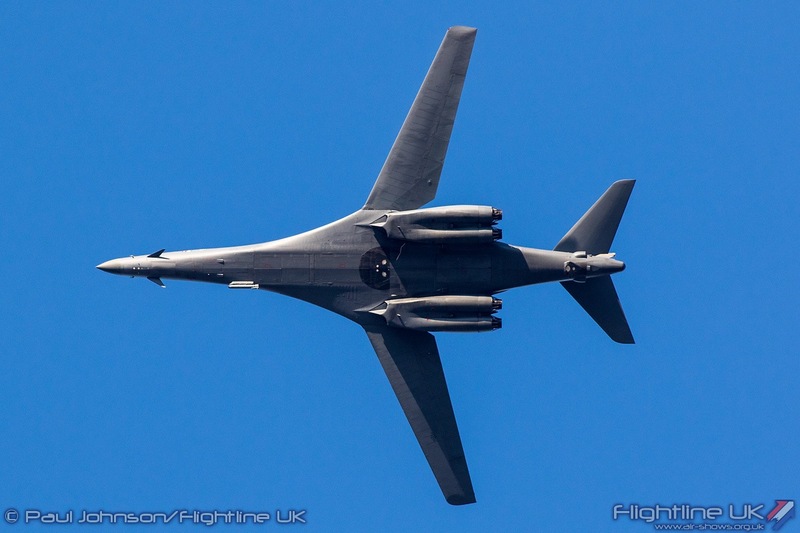 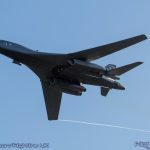 It was followed by an aircraft that couldn’t be more different, a United States Air Force Rockwell B-1B Lancer. 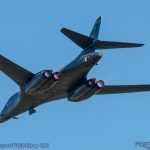 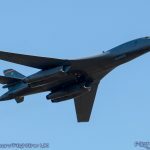 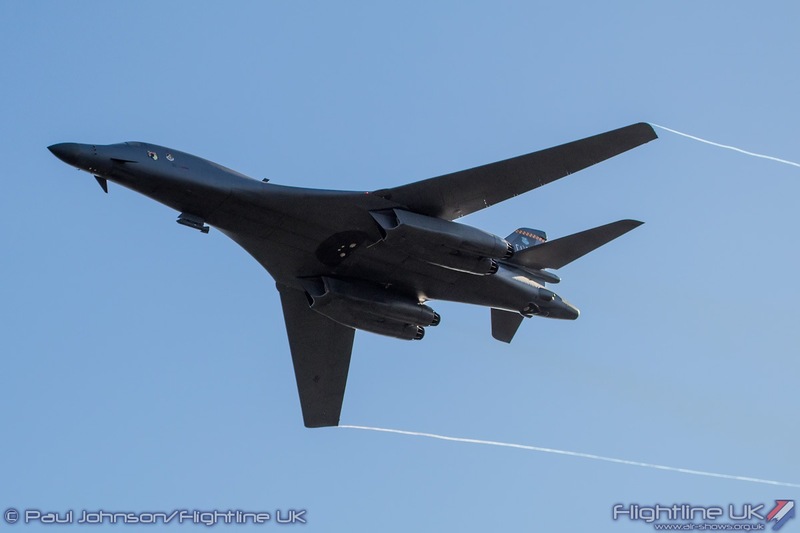 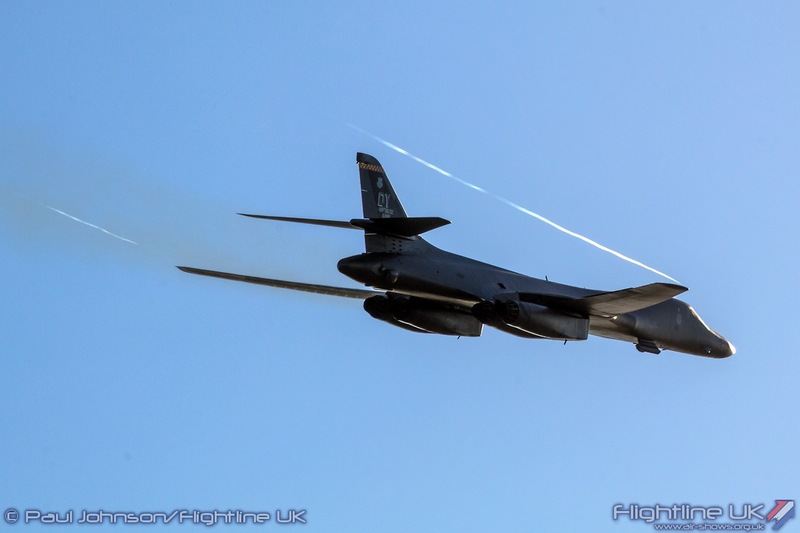 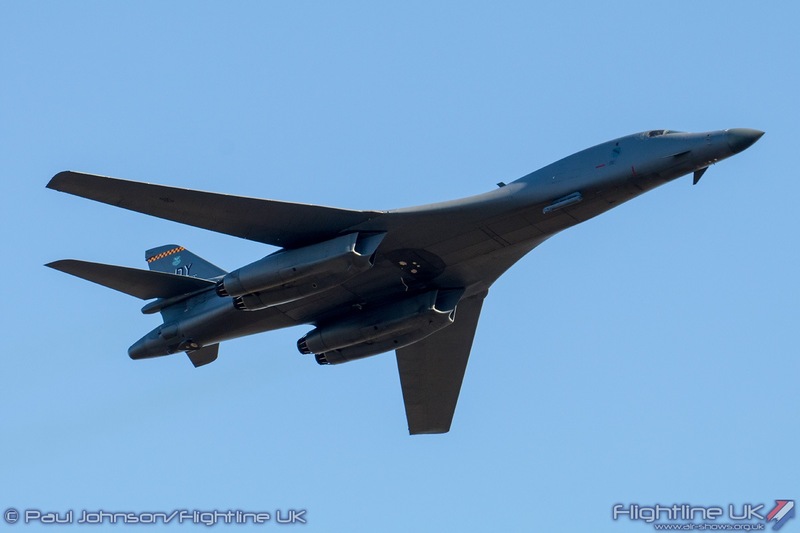 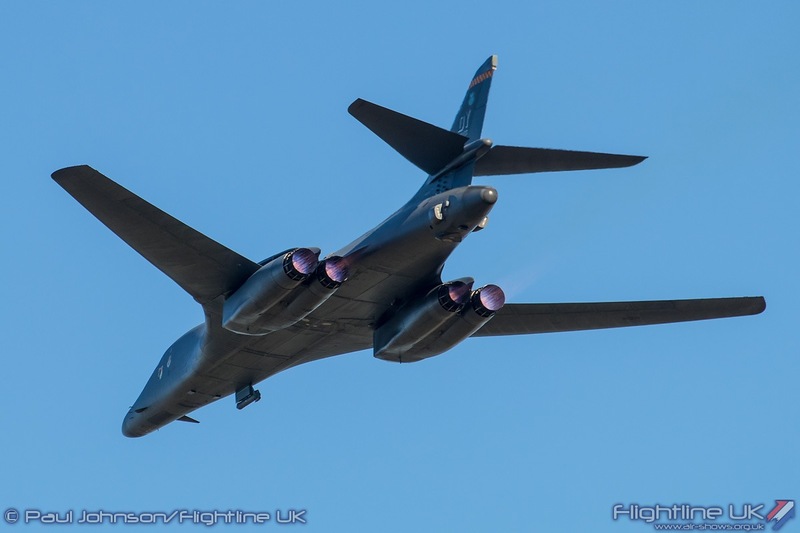 Operating from RAF Fairford, the aircraft was one of two B-1Bs and a B-52H Stratofortress currently based in Europe from Exercise Ample Strike which was taking place in the Czech Republic in early September. 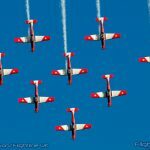 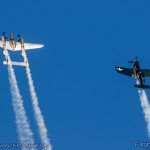 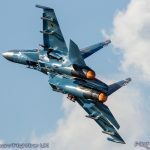 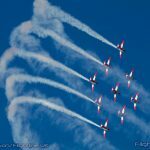 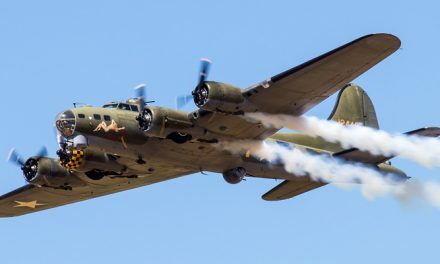 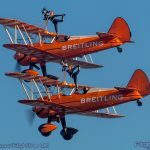 The aircraft arrived incredibly early for their two flypasts and were teasing the crowd for almost an hour while their orbited around nearby Kleine Brogel air base and overhead the airshow. 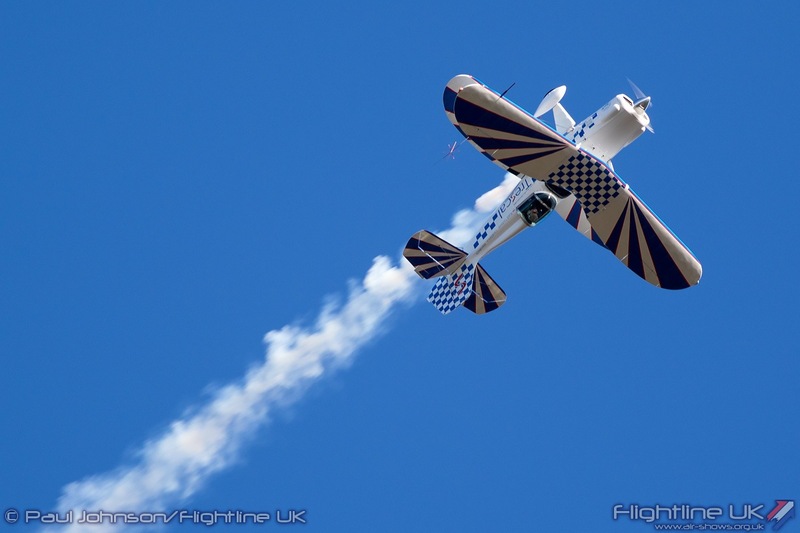 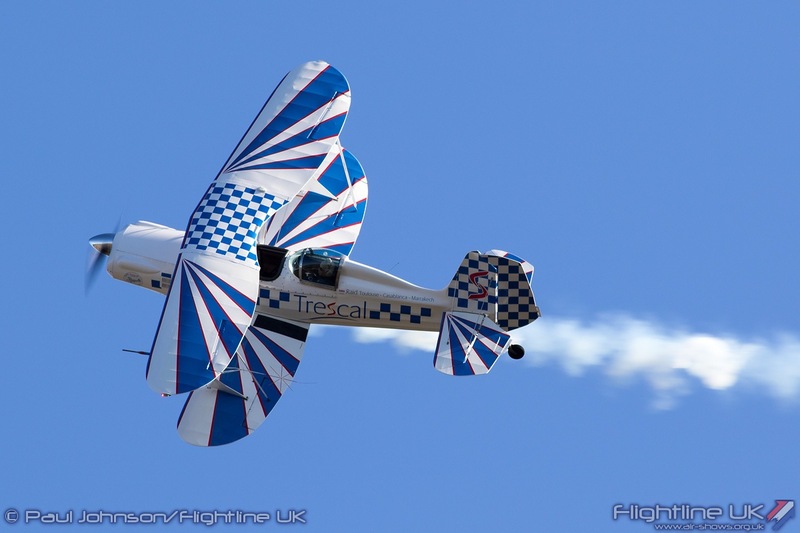 The aerobatics theme was continued by Mark Jefferies in his new Extra 330SC. 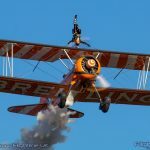 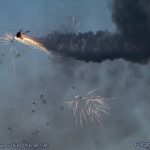 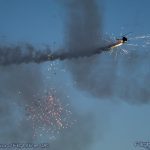 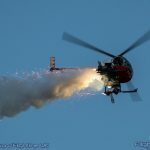 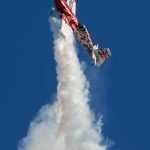 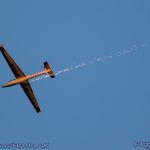 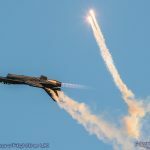 Mark’s displays are always dramatic affairs with some great use of display smoke and some eye-watering gyroscopic figures that send the aircraft tumbling end-over-end thoughout the seven minute routine. 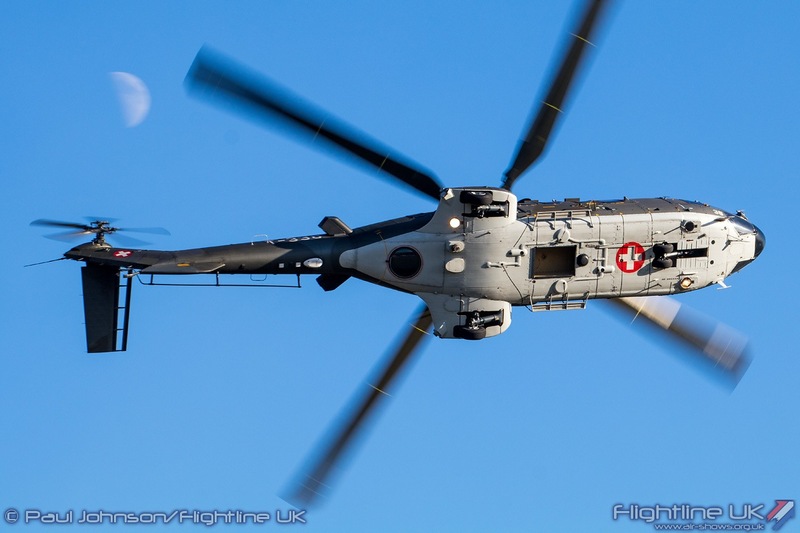 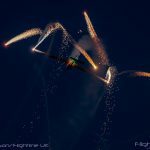 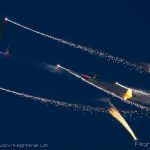 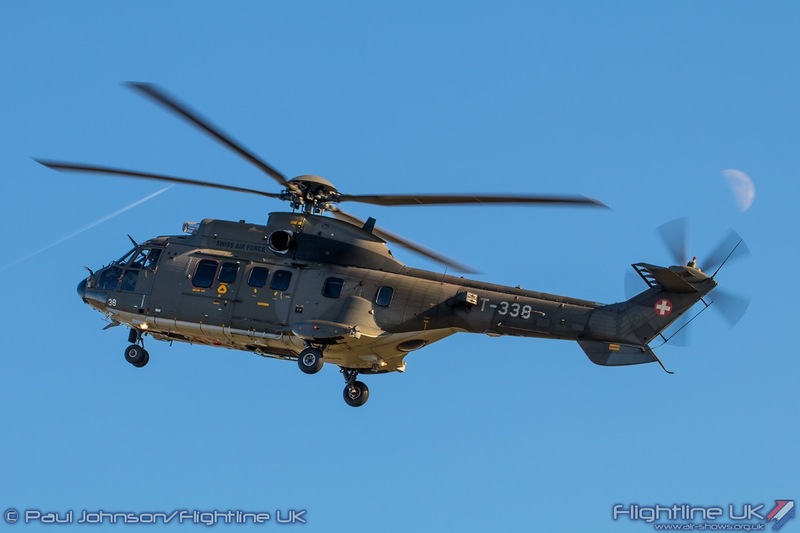 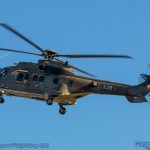 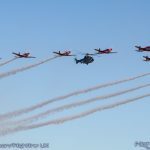 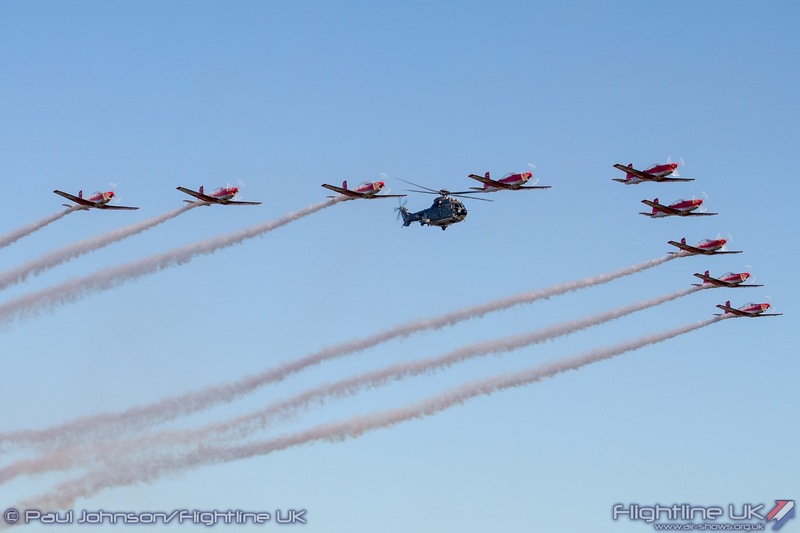 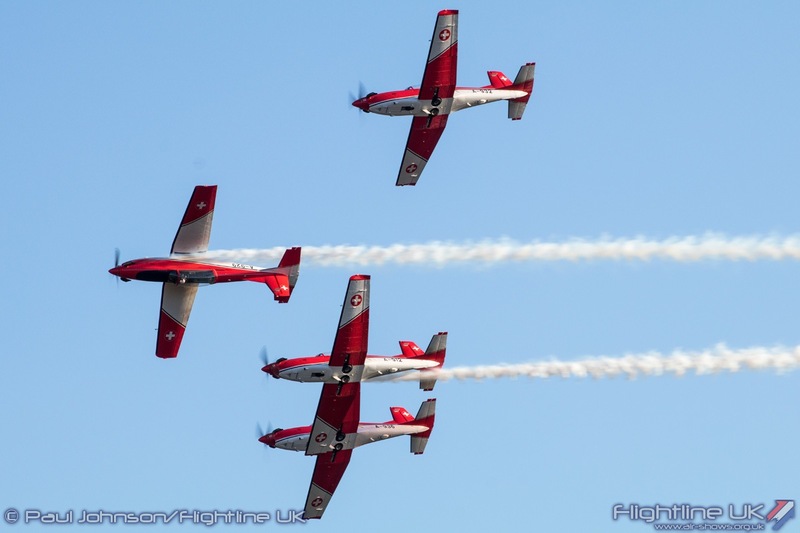 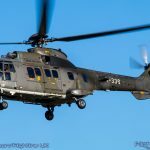 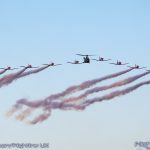 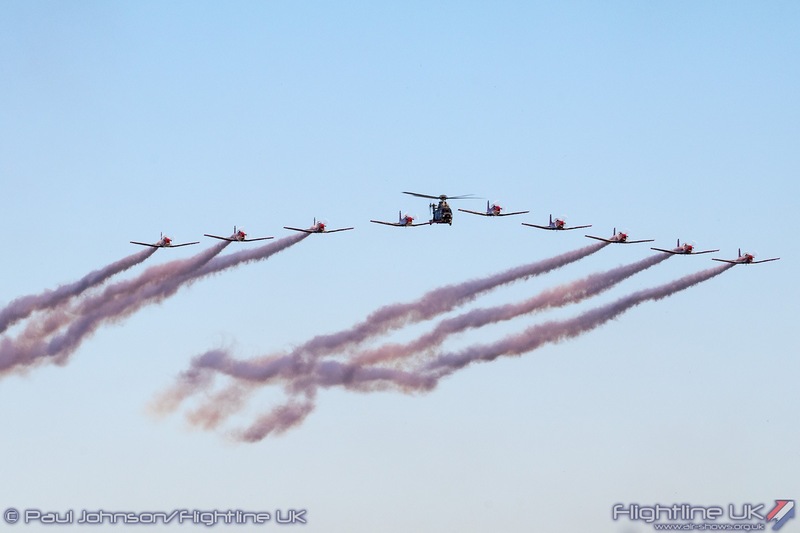 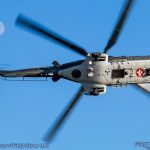 The Swiss Air Force made an impressive contribution to the evening presenting a combined display by the Airbus Helicopters AS332 Cougar and the famous PC-7 Team. 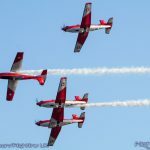 They arrived in formation before the Cougar gave a shortened solo display before the PC-7s regrouped for their own display. 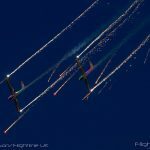 For 2016, the PC-7 have really developed their display adding in a very impressive sequence of air combat simulation plus some further twists on more traditional figures. 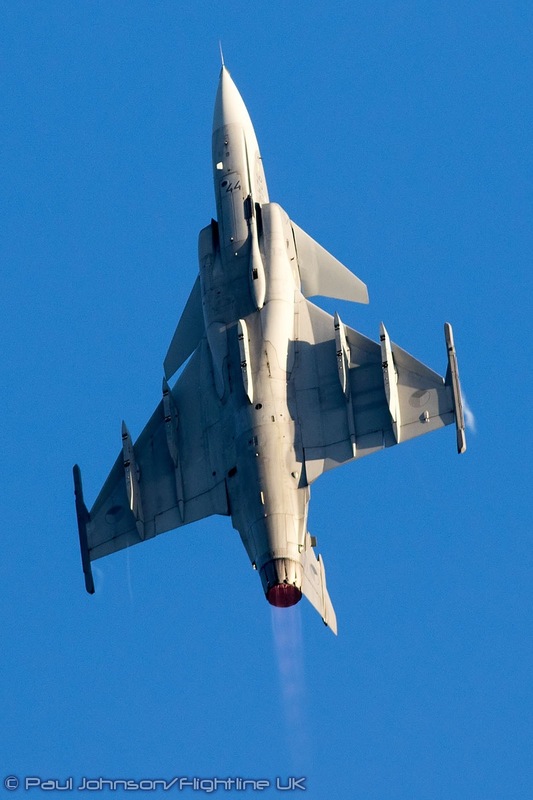 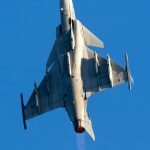 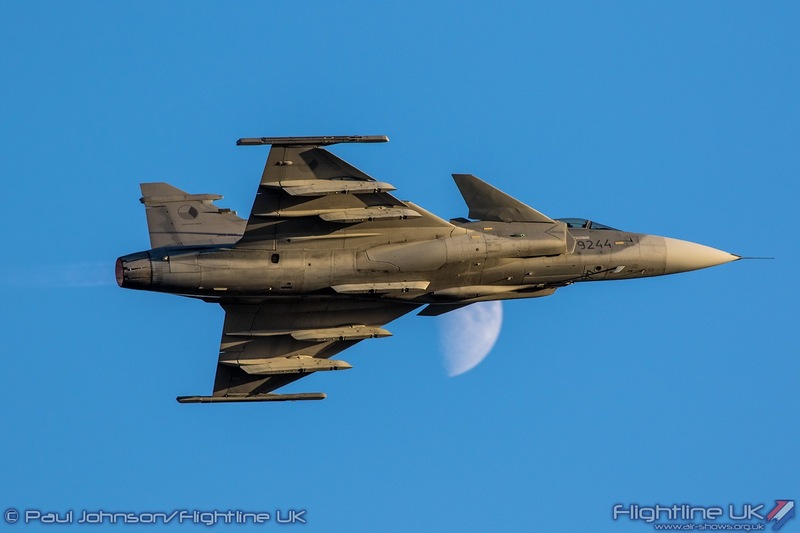 The Czech Air Force also made a spectacular contribution to the evening flying with their solo SAAB JAS-39C Gripen. 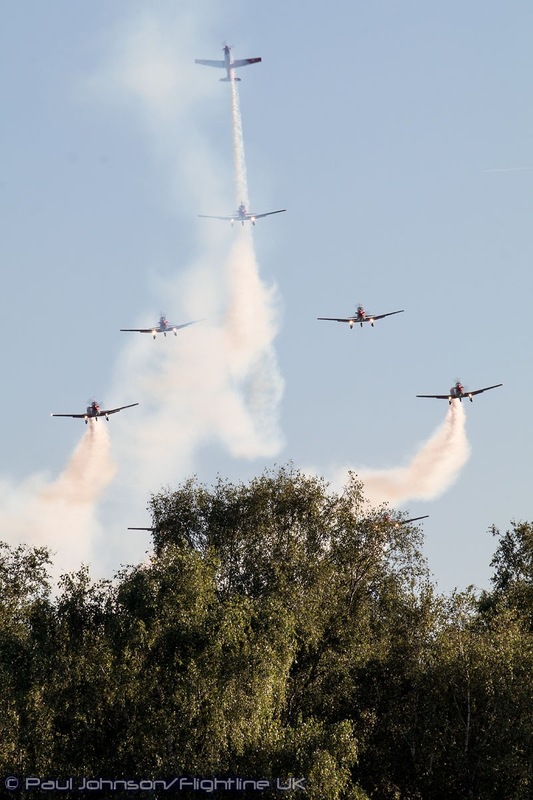 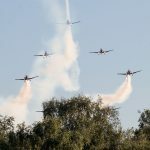 This year’s event celebrated 55 years of the NATO Tiger Association to which the show maintains close links via 31 Tiger Squadron based at Kleine Brogel. 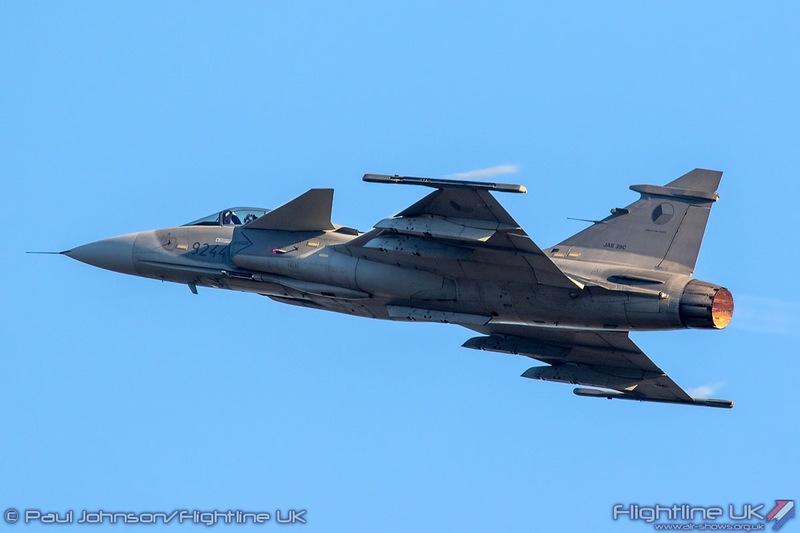 The Gripen looked fantastic with the golden rays of sunshine transforming the normally fairly drab looking grey jet! 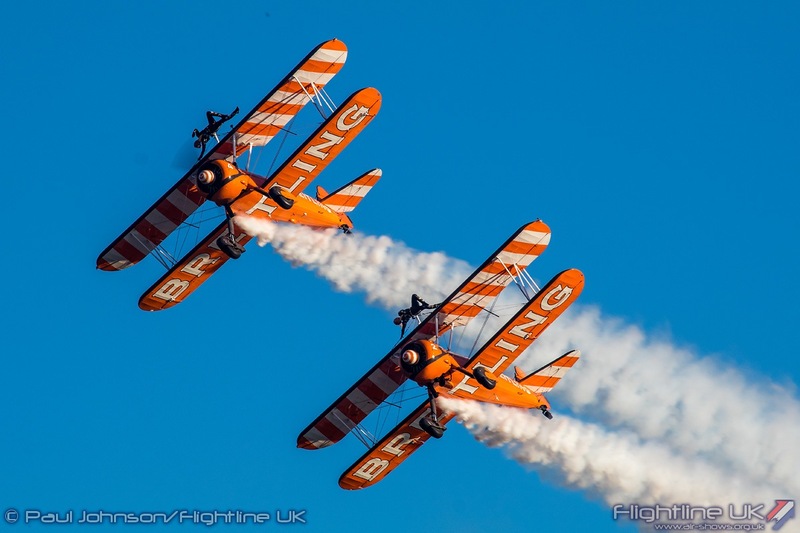 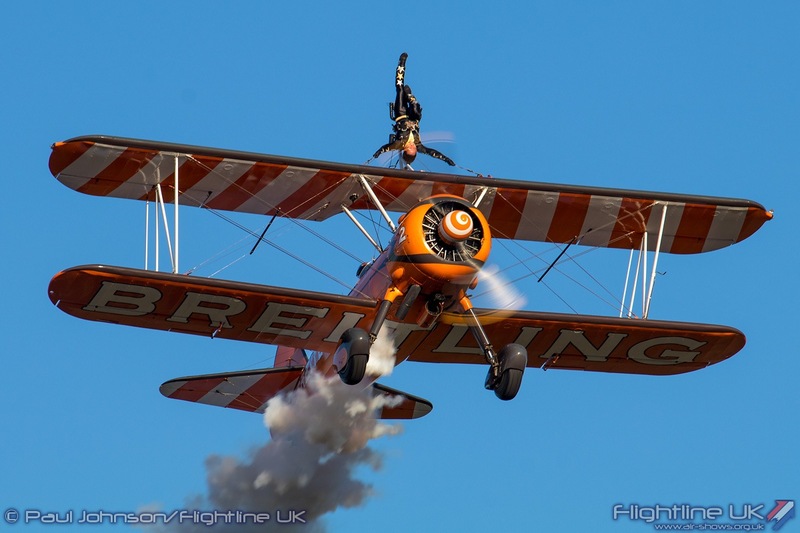 The Breitling Wingwalkers are Sanicole favourites and made a welcome return this year. 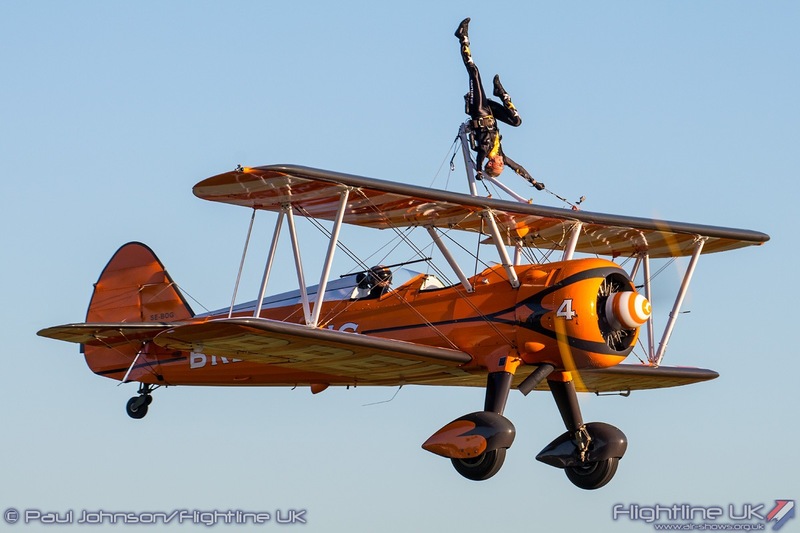 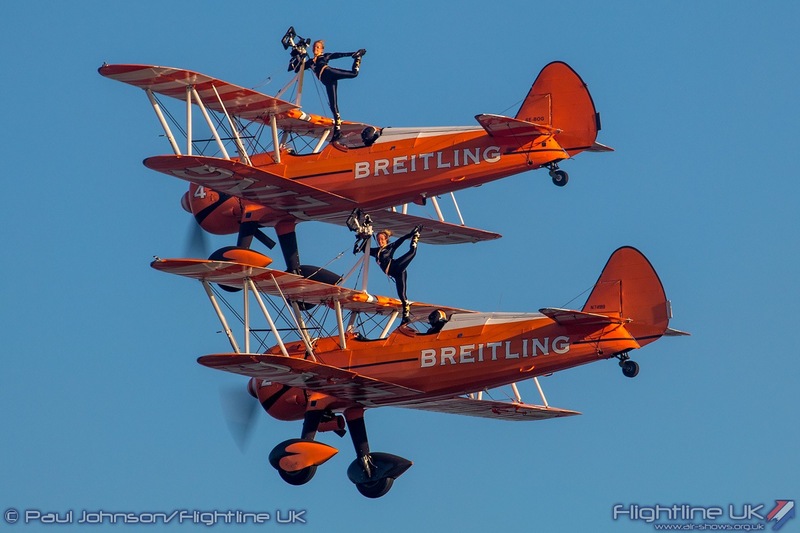 For pilots Dave Barrell and Martyn Carrington plus wingwalkers Emily Guilding and Florence Rolleston-Smith Sanicole came off the back of a very busy mini-tour of Europe which saw them display in Sweden, France and the Channel Islands in the days leading up the Sunset Show. 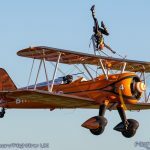 The clear skies and golden sunshine really made the orange colour scheme on their Boeing Stearmans ‘pop’ as they performed over the airfield. 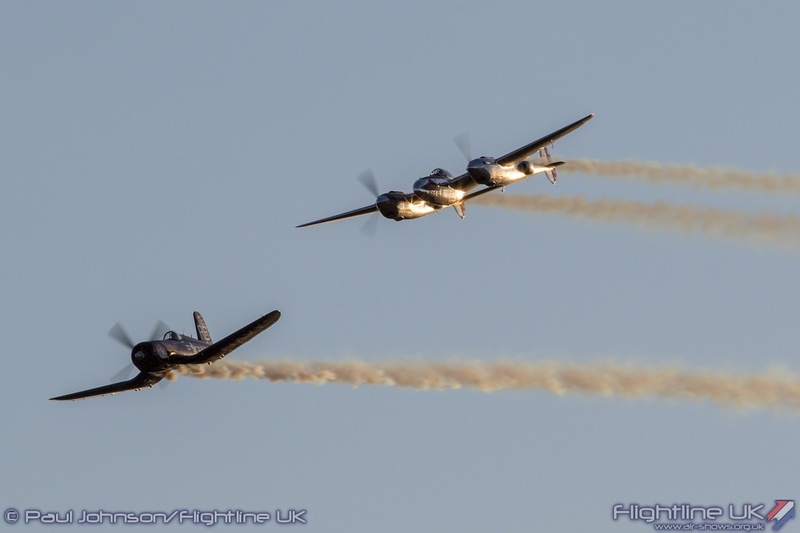 No sunset display would be complete with warbirds. 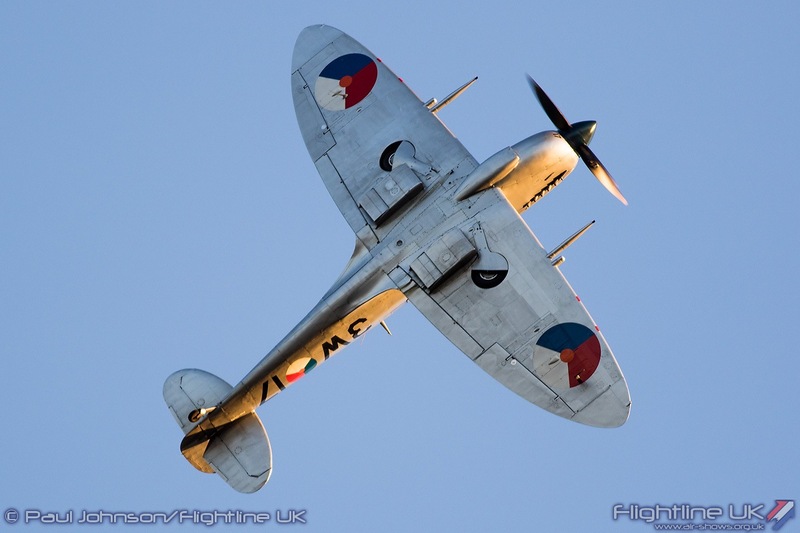 There is something very emotive about watching historic military aircraft performing during the light of a summer evening. 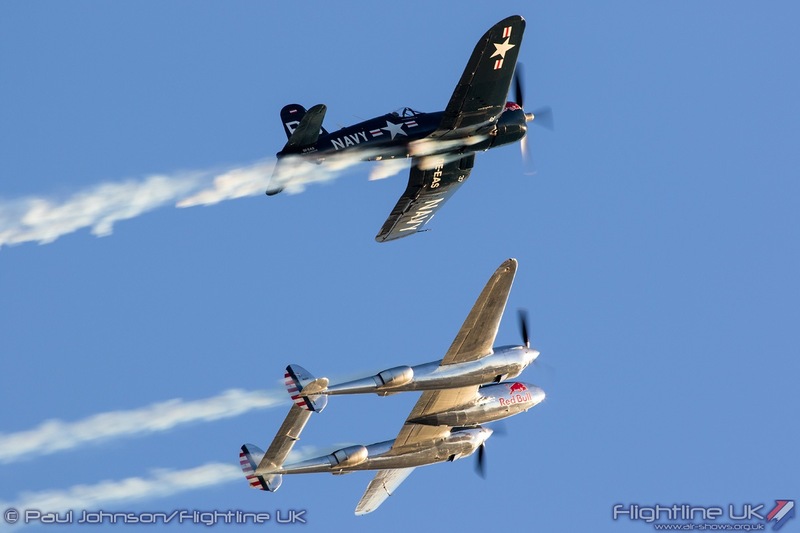 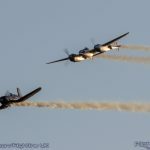 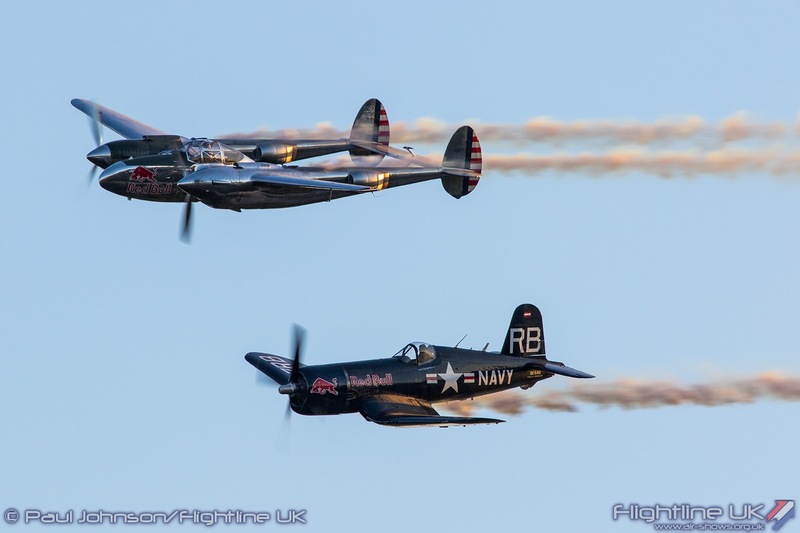 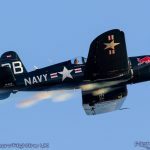 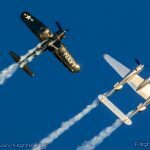 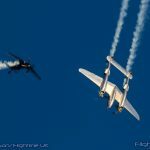 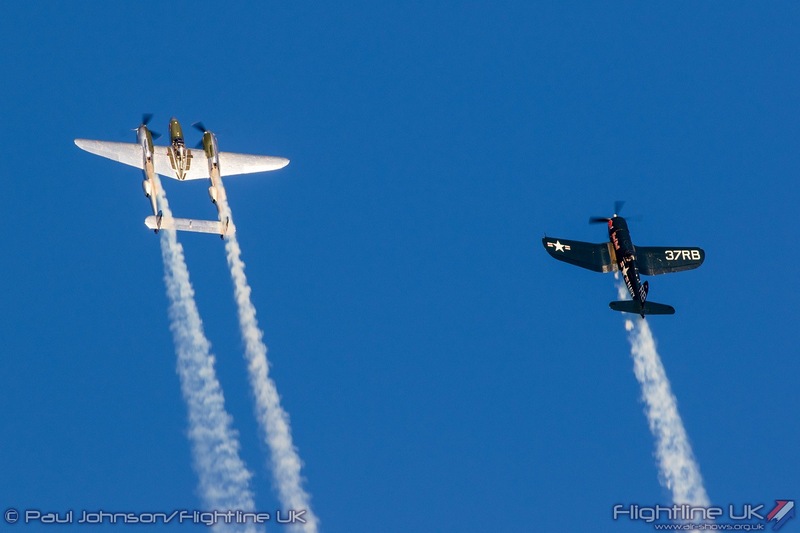 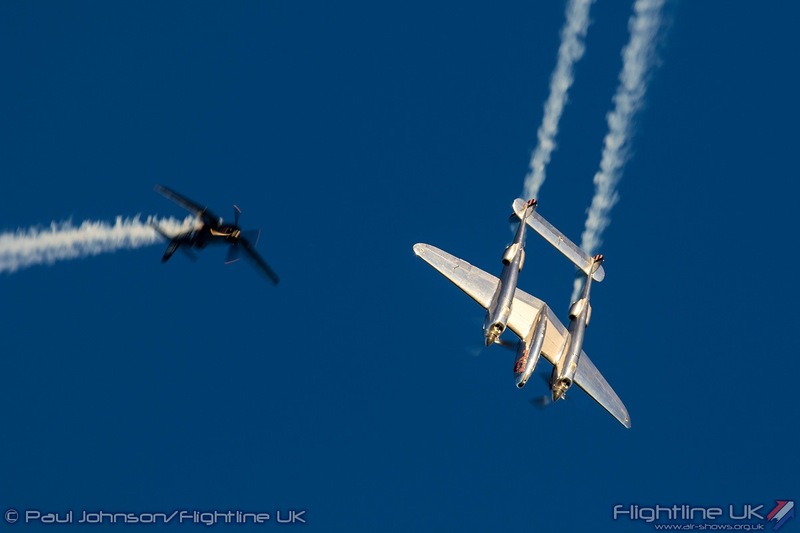 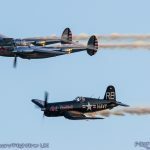 The Flying Bulls pair of Lockheed P-38J Lightning and Chance Vought F4U Corsair looked particularly stunning as they powered their way around the skies highlighting their flightpaths with delicate smoke trails. 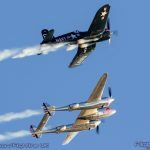 In particular, the overall chromed finish of the P-38 really stood out reflected the sun and the Belgian countryside on its various surfaces. 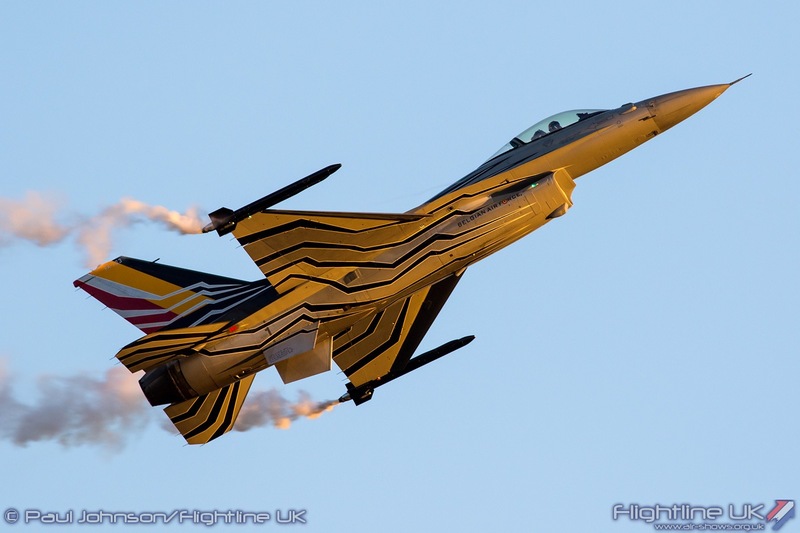 2016 marks the 70th anniversary of the Belgian Air Force. 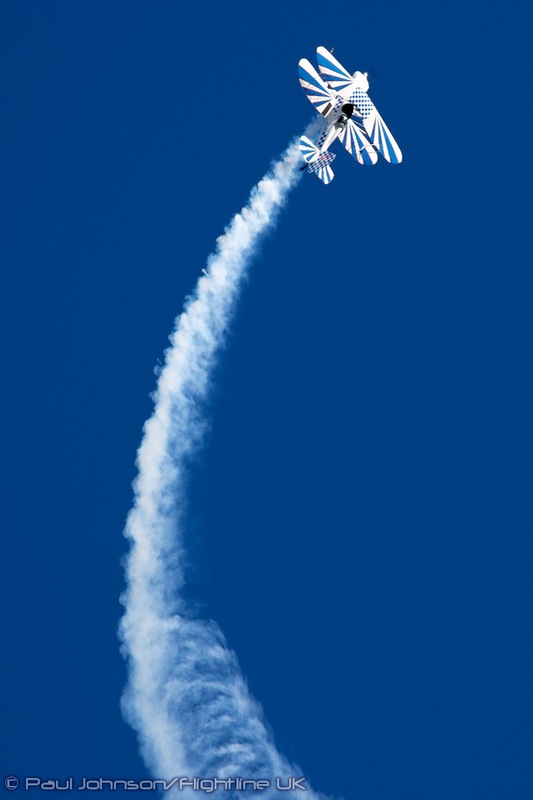 The anniversary has been marked at various events by a travelling exhibition which was also at Sanicole. 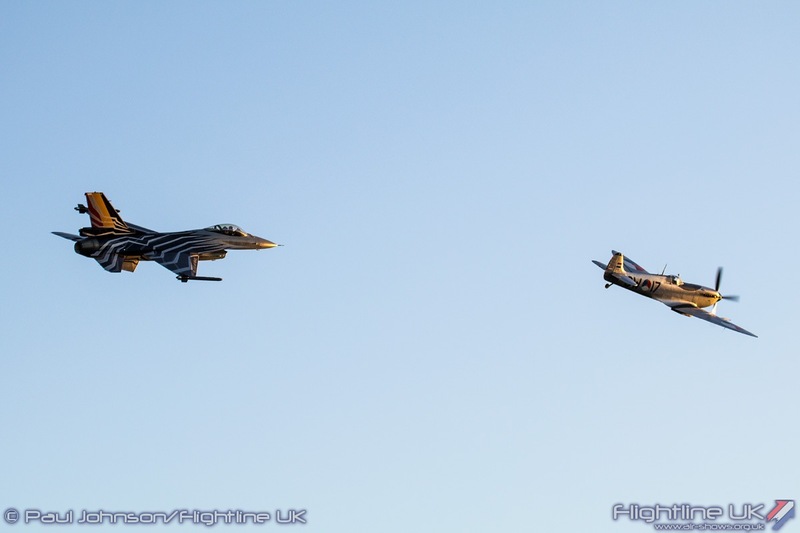 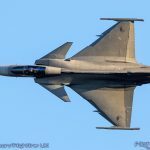 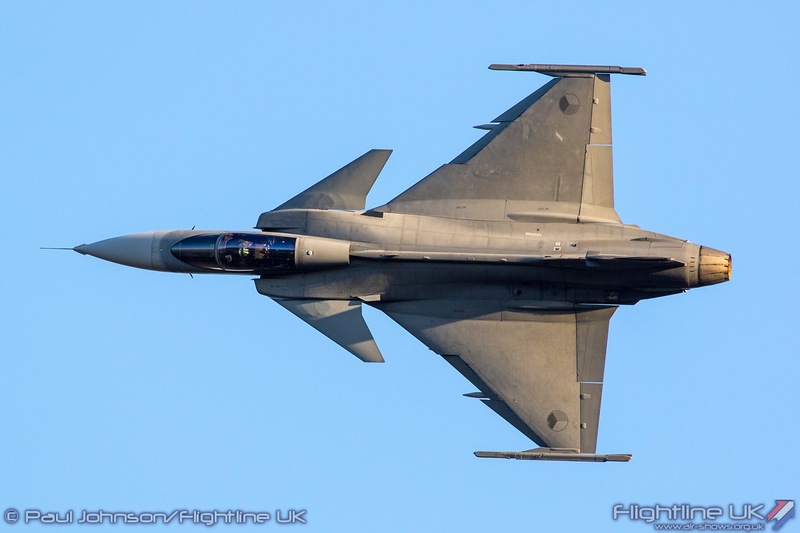 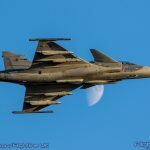 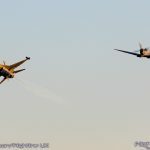 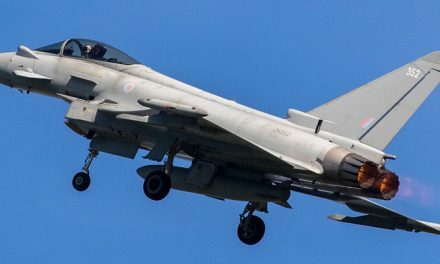 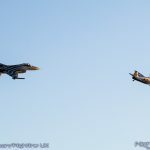 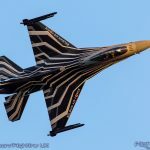 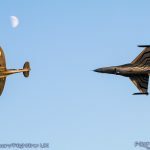 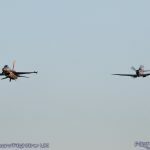 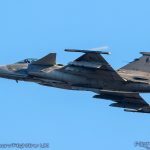 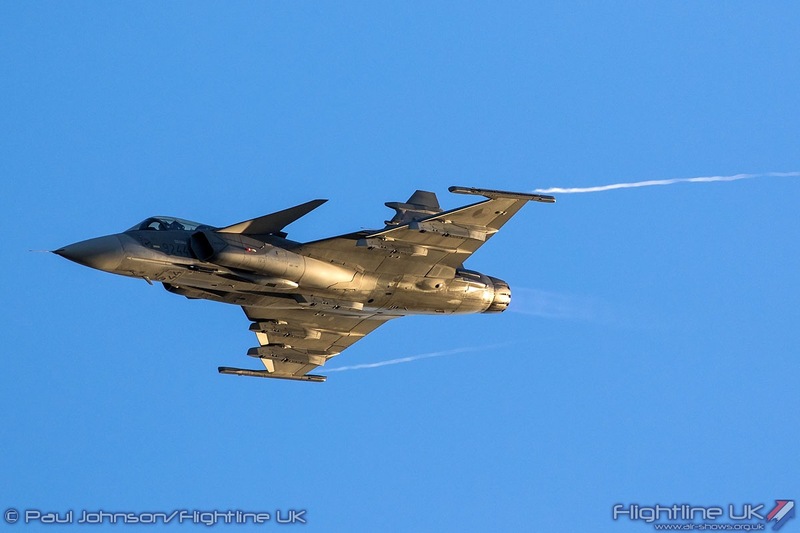 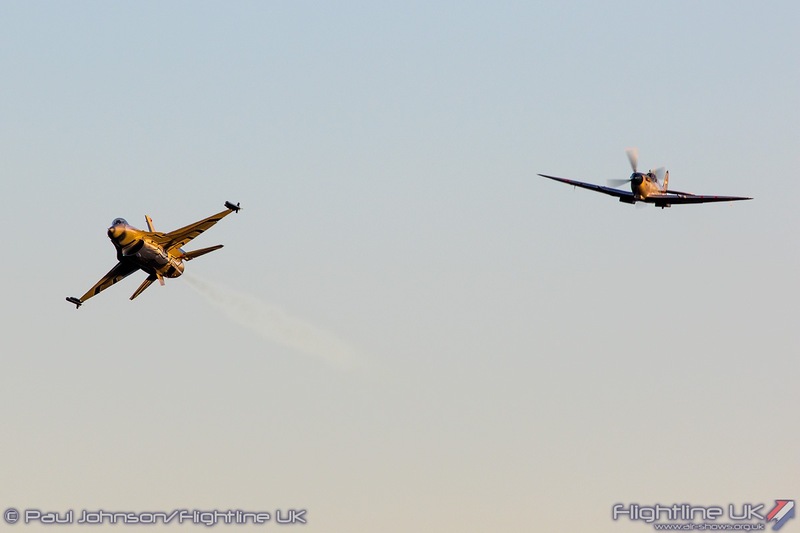 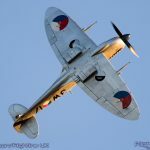 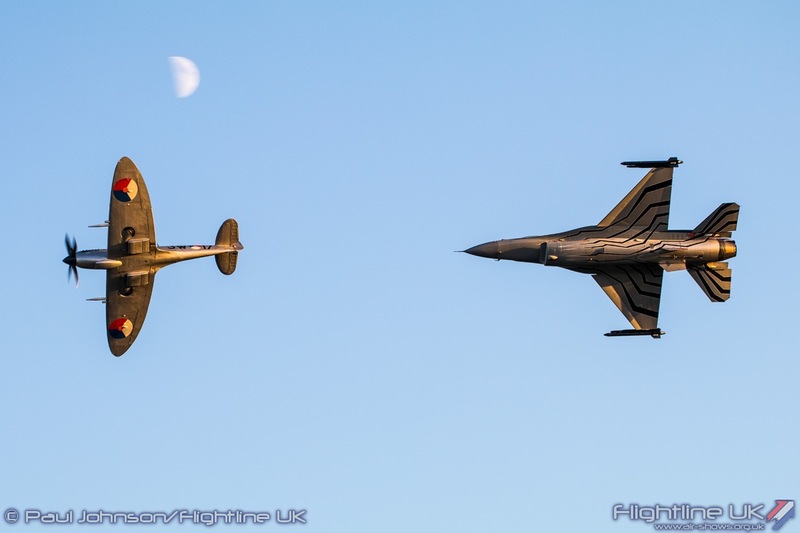 In the air, the anniversary was marked by the combination of the solo F-16AM Fighting Falcon and the Royal Netherlands Air Force Historic Flight’s Supermarine Spitfire IX. 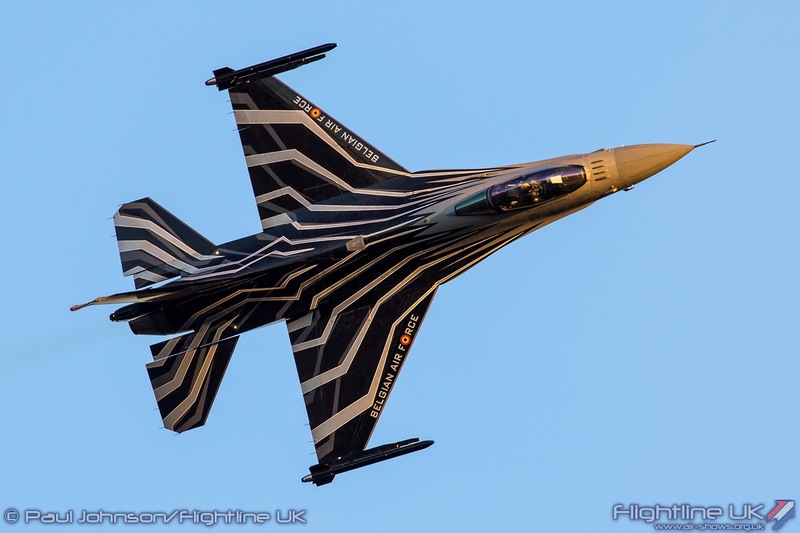 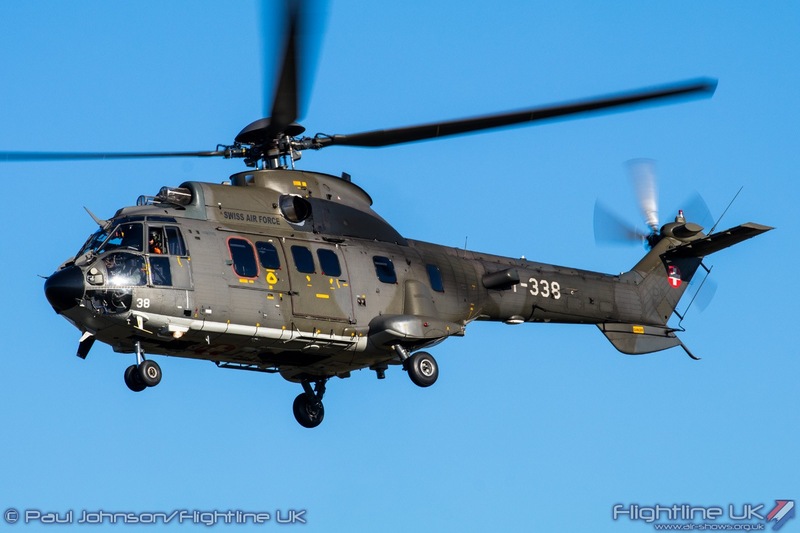 The latter was one of the first types to be operated by the Belgian Air Force as it formed an an independent air arm. 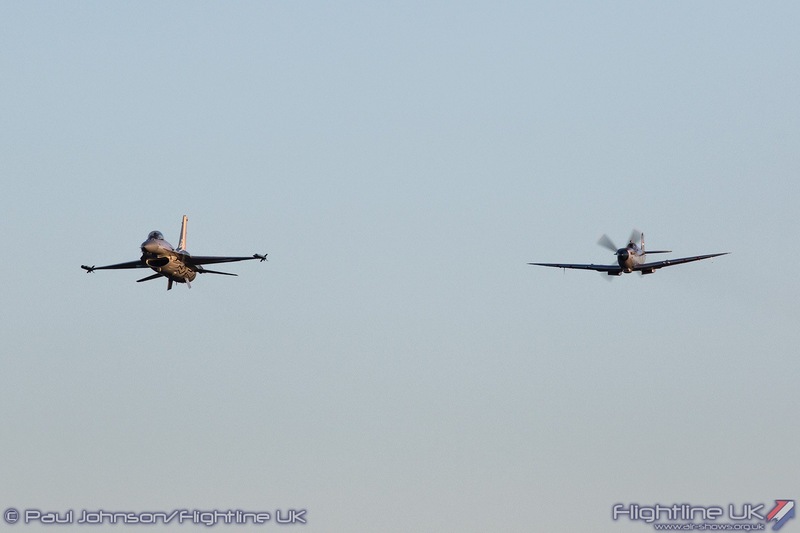 The pairing made two close formation passes before a head-on split than lead on to the F-16’s solo display. 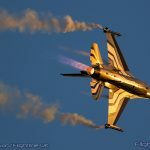 The F-16 is always one of the highlights of the evening show. 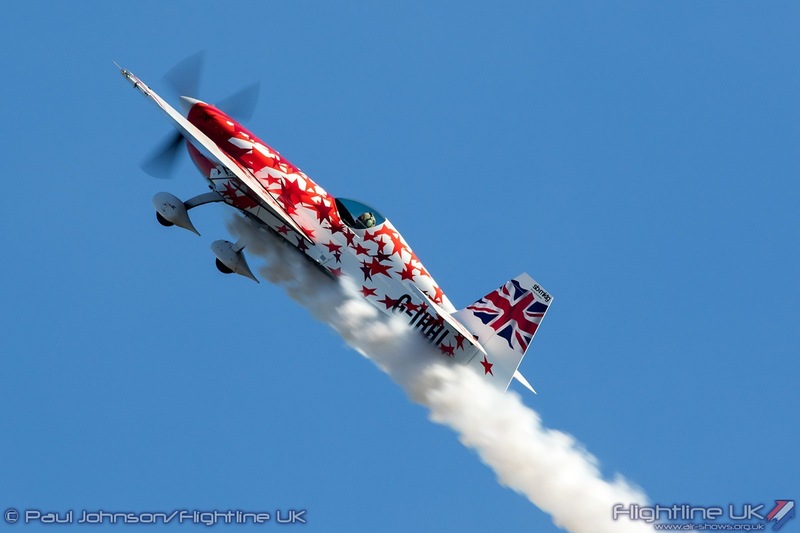 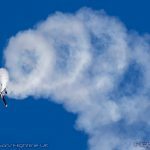 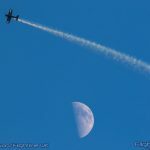 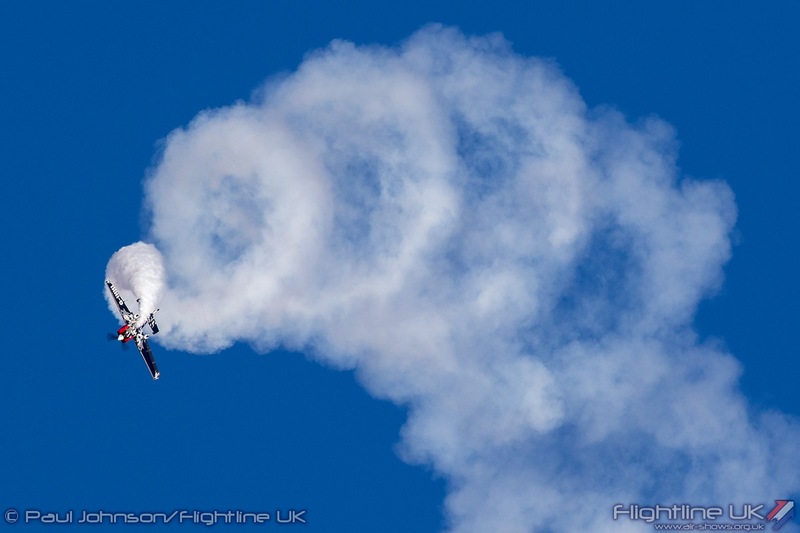 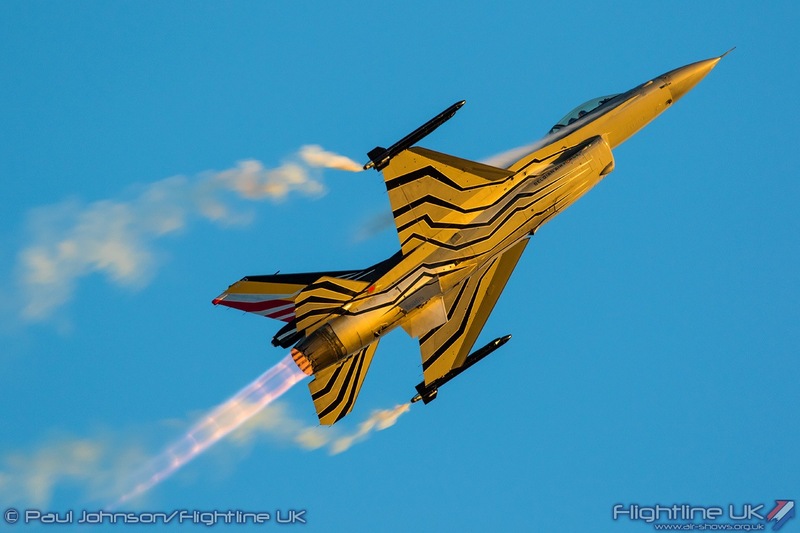 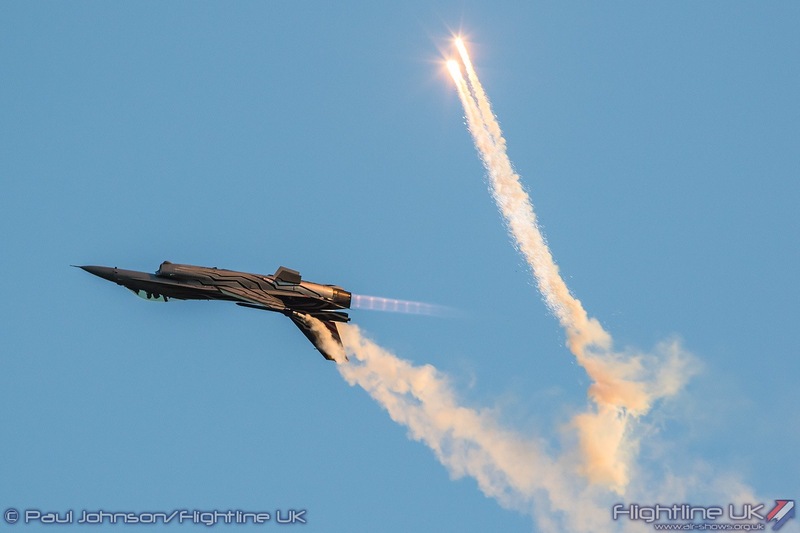 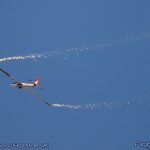 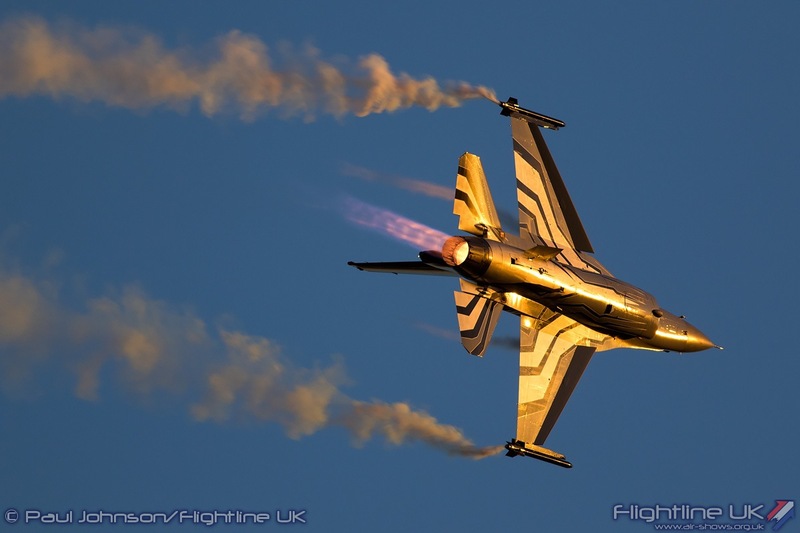 As ever Tom ‘Gizmo’ de Moortel’s display is one of the very best fast jet display in Europe. 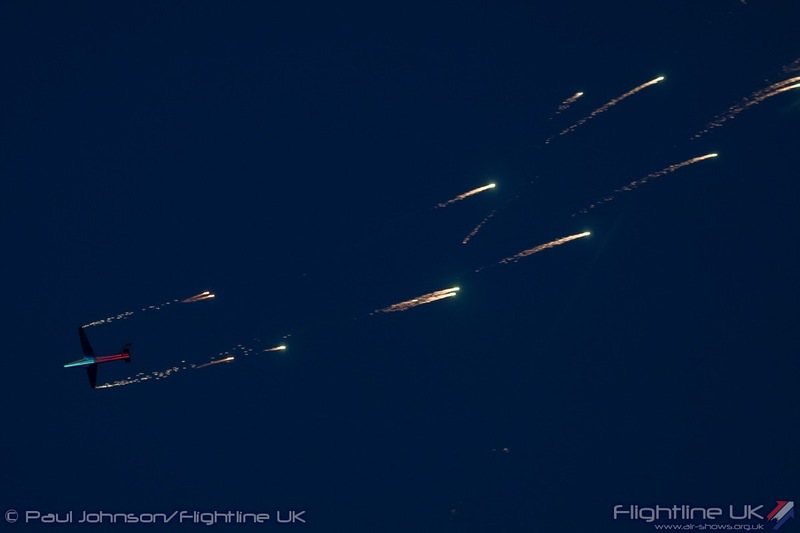 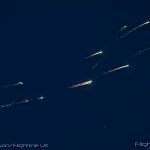 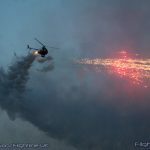 However, the dark, gin clear skies meant that the flames from the aircraft’s reheat were much more prominent and the flares left huge trails of sparks and smokes as they were released from their dispensers! 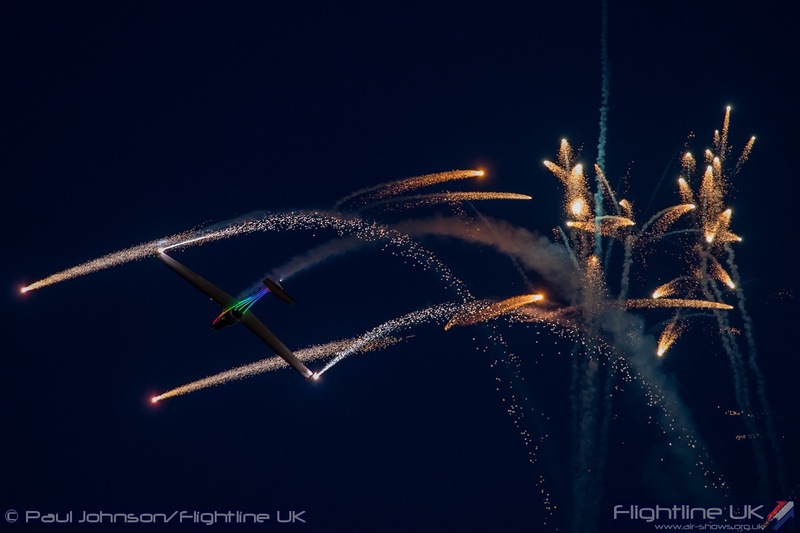 The final quartet of acts were all specialist twilight pyrotechnic displays. 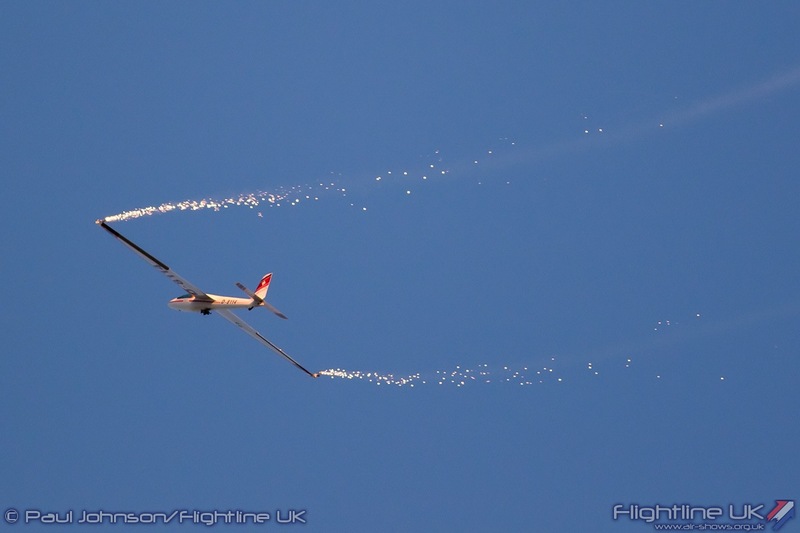 First to displays was the Skydance Glider Display Team from Germany. 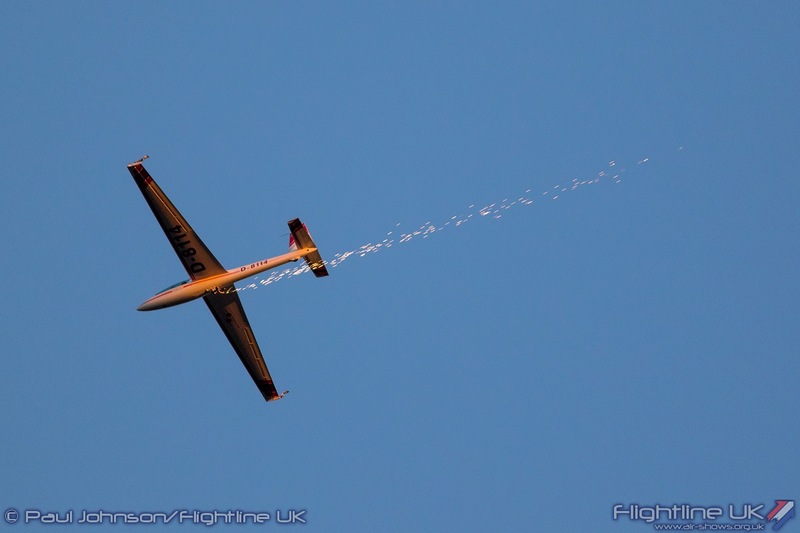 They fly the Marganski S-1 Swift glider, the world’s most successful single seat aerobatic glider. 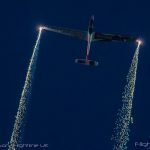 For the evening performance Lars Lehmann flew a very elegant routine with wingtip and under-fuselage mounted sparkling waterfalls and a stream of starburst effects. 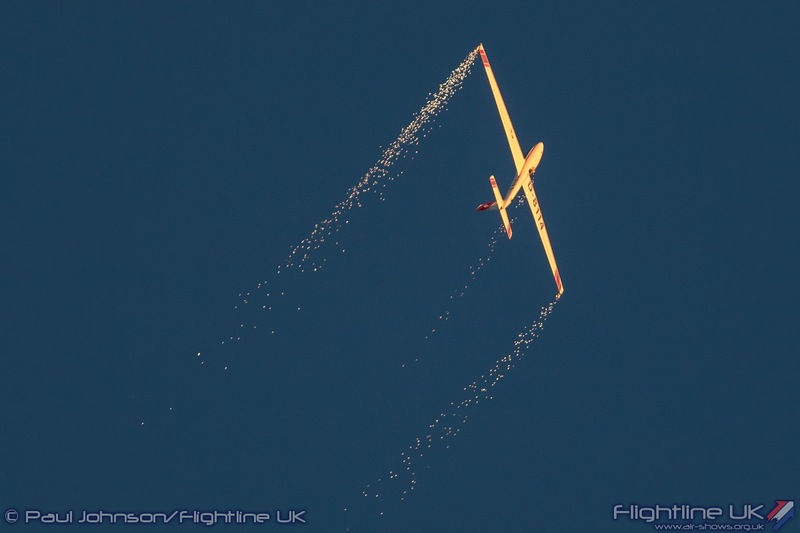 Contrasting to the elegance of the glider was the fanfare and chaos of OTTO the Helicopter. 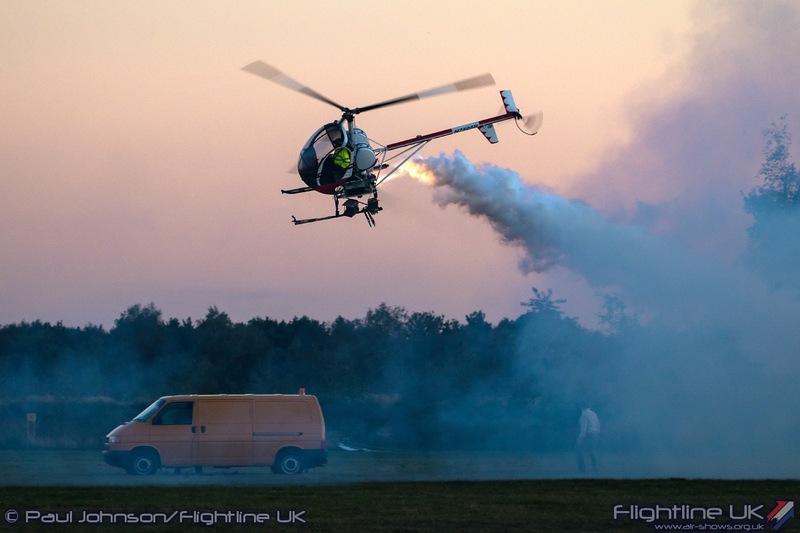 OTTO is a Schweizer 300C helicopter and has recently been imported into the UK by Brendan O’Brien for his own flying circus. 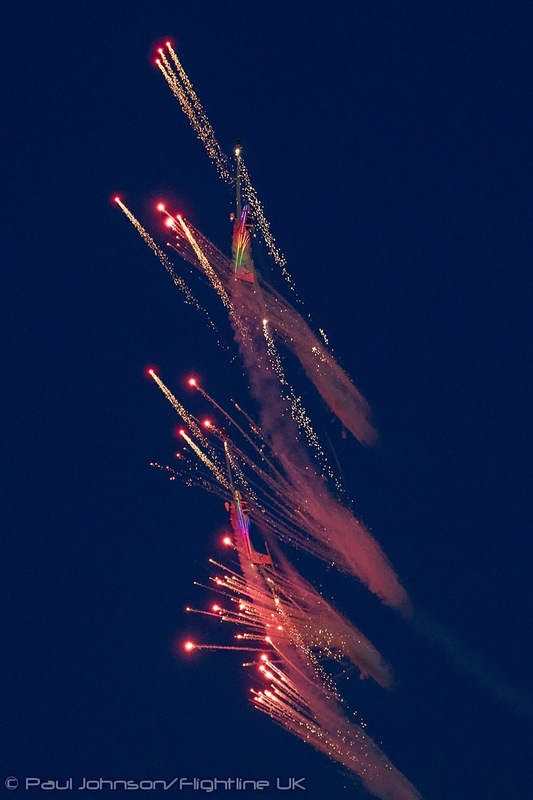 OTTO can perform a wide variety of different acts including an incredible fireworks show. 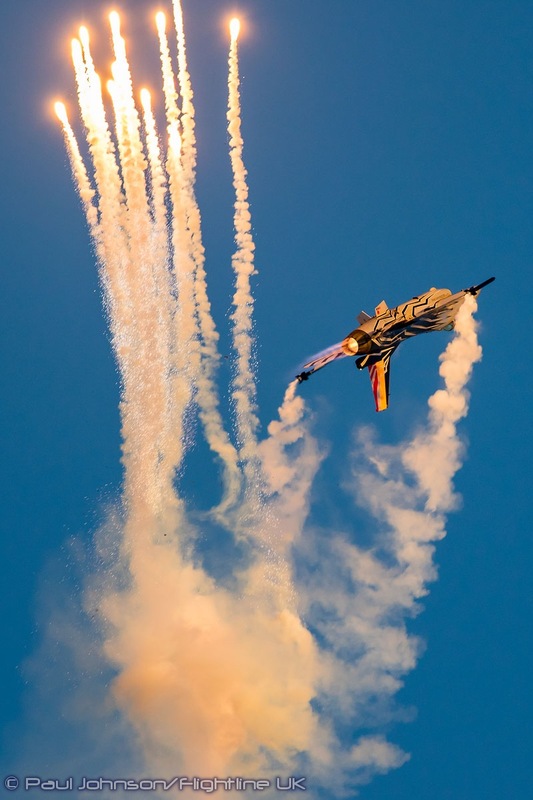 OTTO carries upwards of 100 individual pyrotechnics which takes Brendan and his team nearly 10 hours of work just to fit and connect up to the firing system! 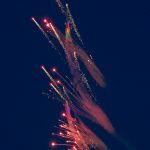 The results is a cacophony of smoke, light and noise as OTTO traversed around the evening twilight. 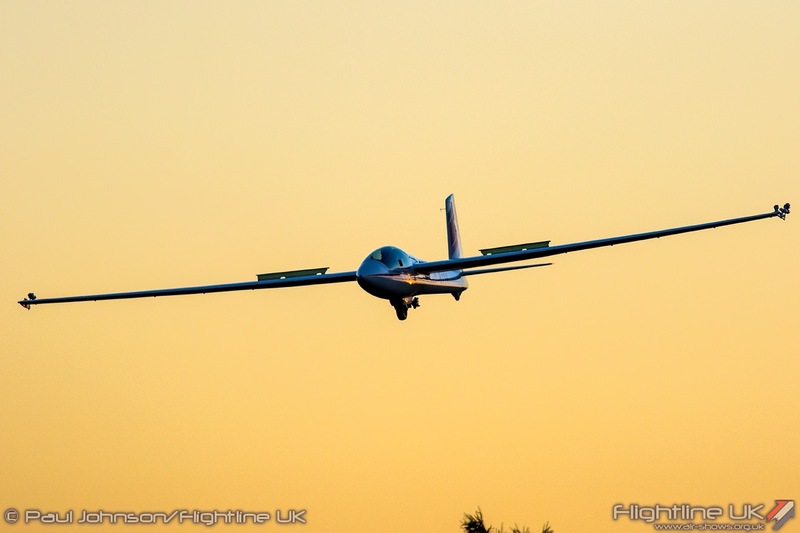 AeroSPARX with their pair of Grob 109b motorgliders were another team making their Sanicole debut. 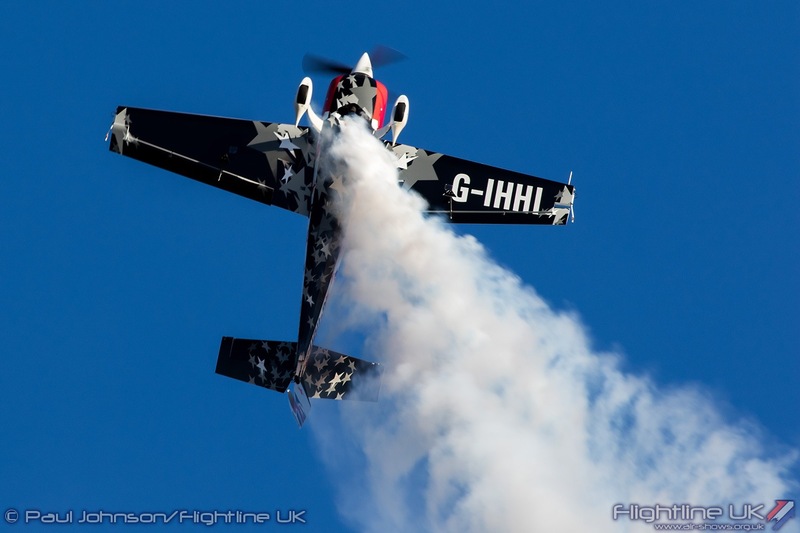 The team is led by Tim Dews who is the UK’s “Mr Grob” and he is joined by Guy Westgate. 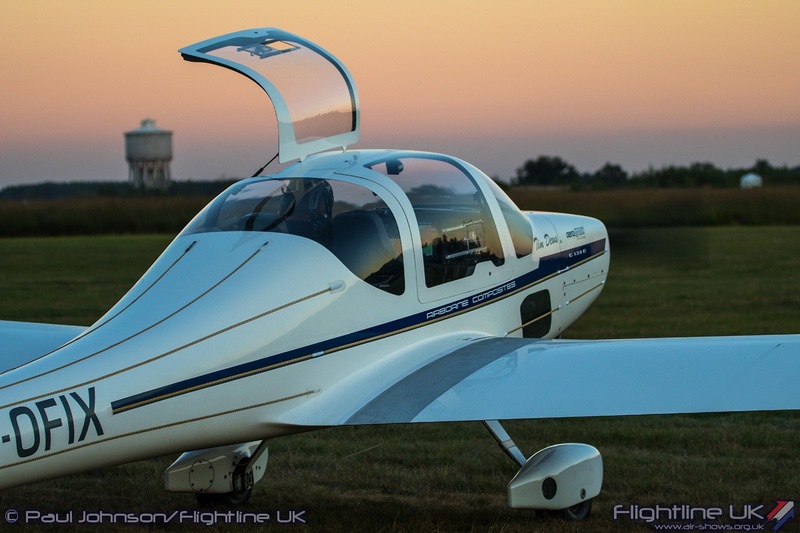 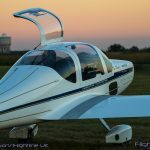 The Grob is both elegant and has enormous presence thanks to its long wings. 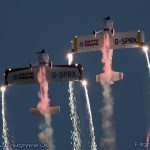 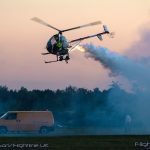 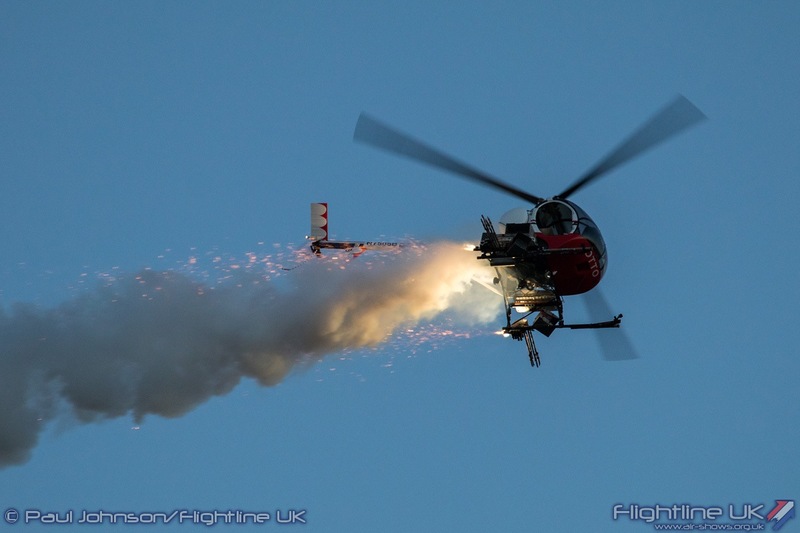 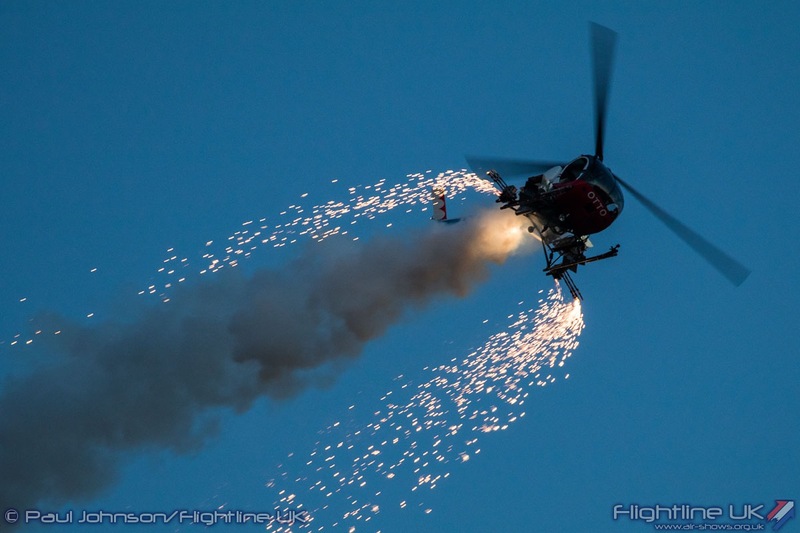 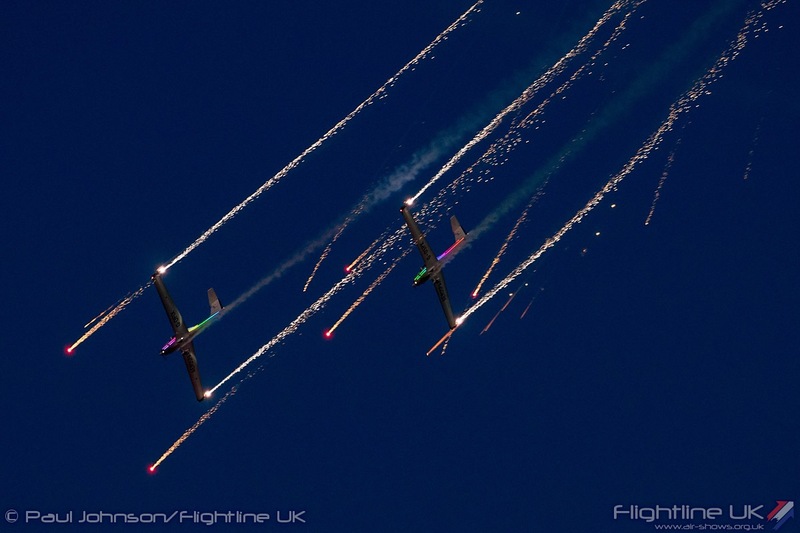 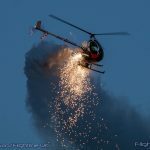 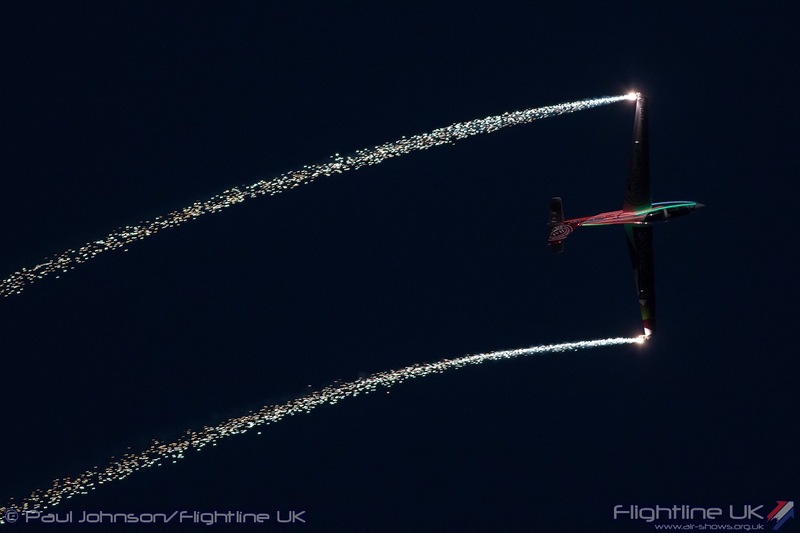 The teams aircraft are special not only because they carry pyrotechnics and a fantastic LED lighting system, but they are also the only Grob 109s to be certified for aerobatics. 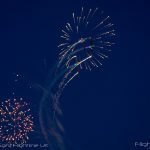 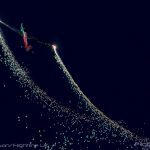 Their display is an amazing spectacular with thick streams of bright sparks falling from their wingtips, roman candles shooting forward and backward plus huge star bursts. 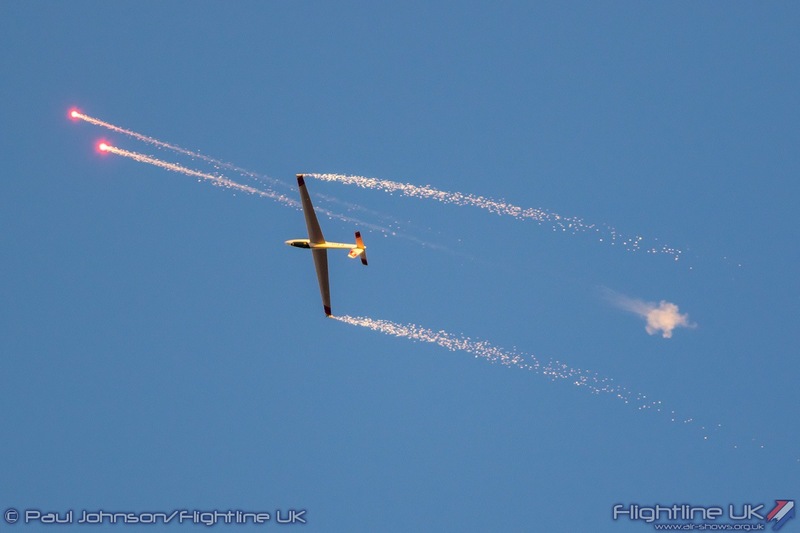 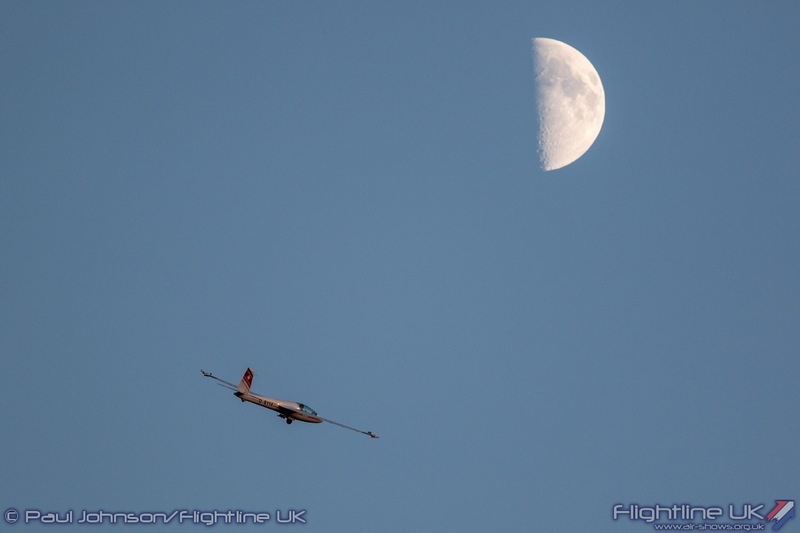 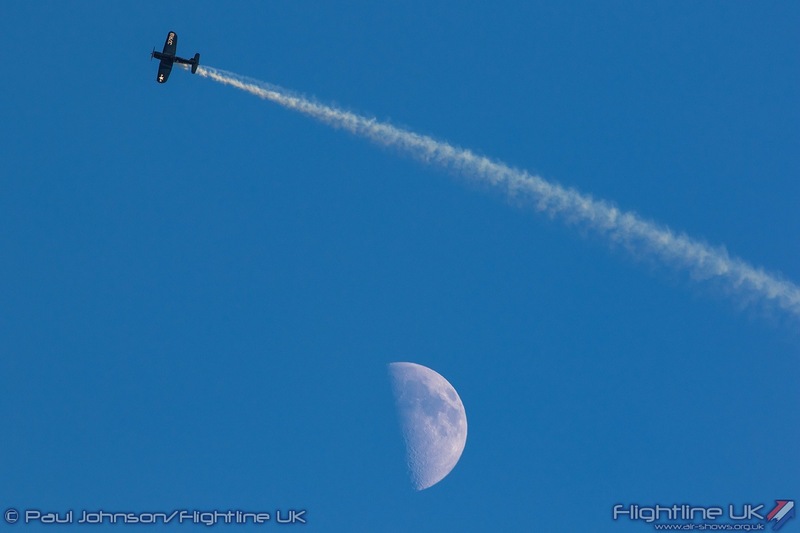 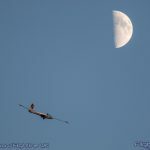 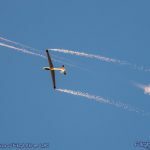 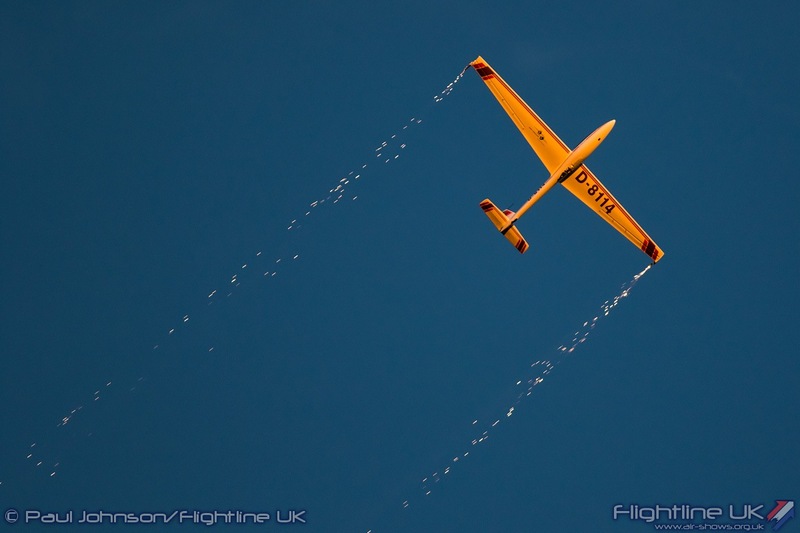 The display was closed by Ian Gallacher flying the GliderFX Display Team’s MDM-1 Fox Glider. 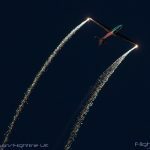 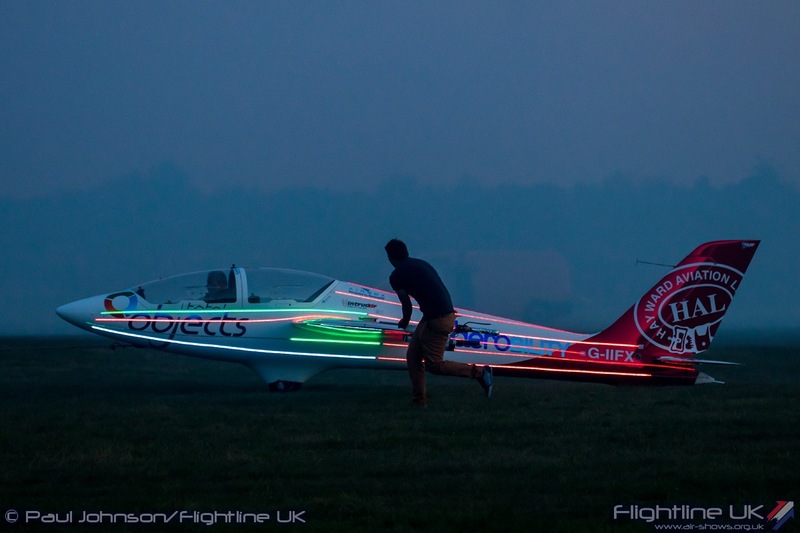 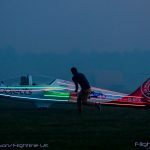 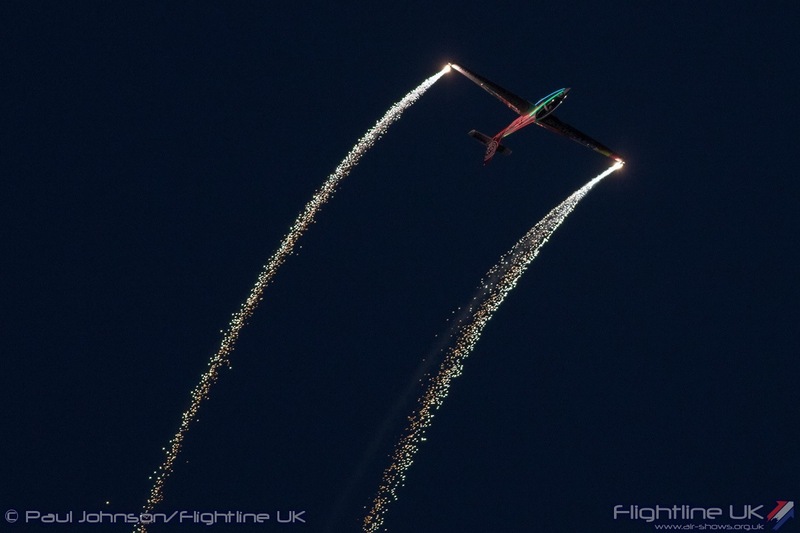 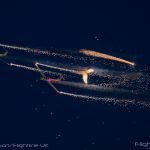 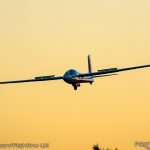 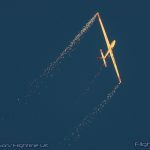 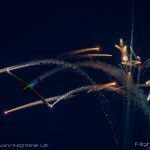 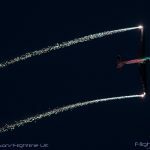 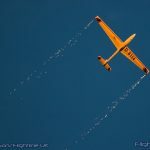 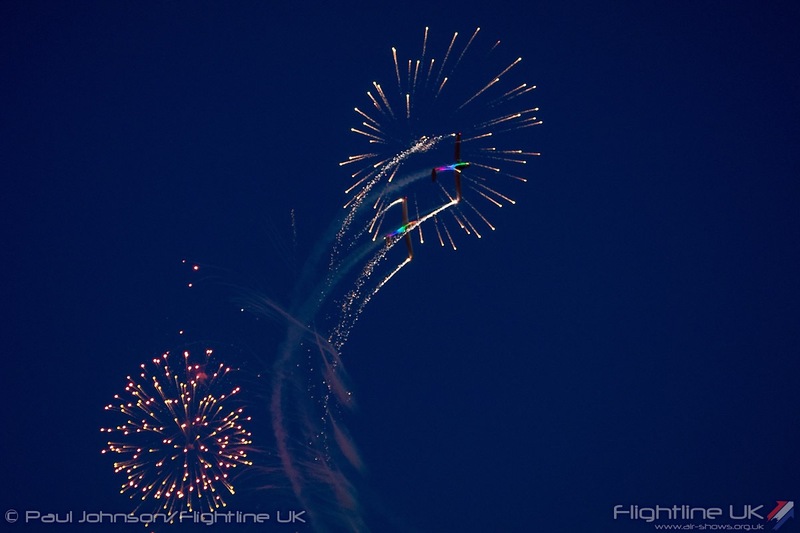 This glider shares similar modifications to the AeroSPARX aircraft with animated LED lighting and spectacular pyrotechnics firing from the wingtips. 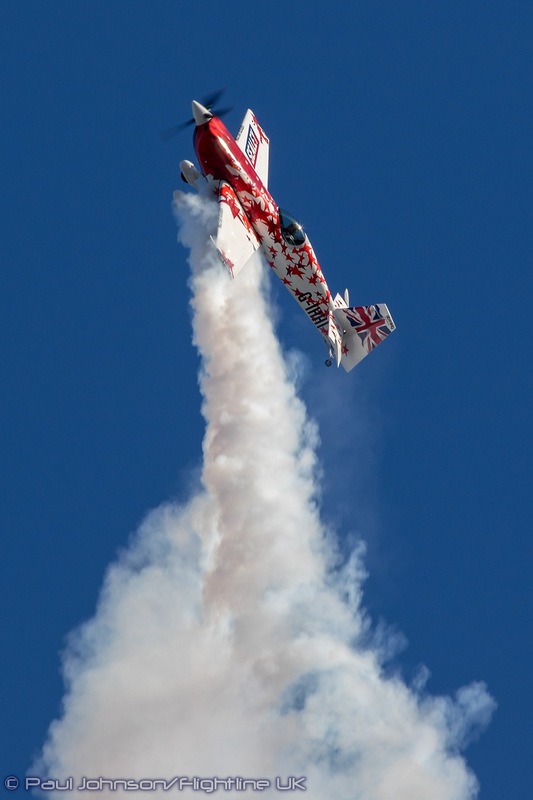 Ian flew a very smooth, flowing routine of aerobatics to close the flying display in beautiful fashion. 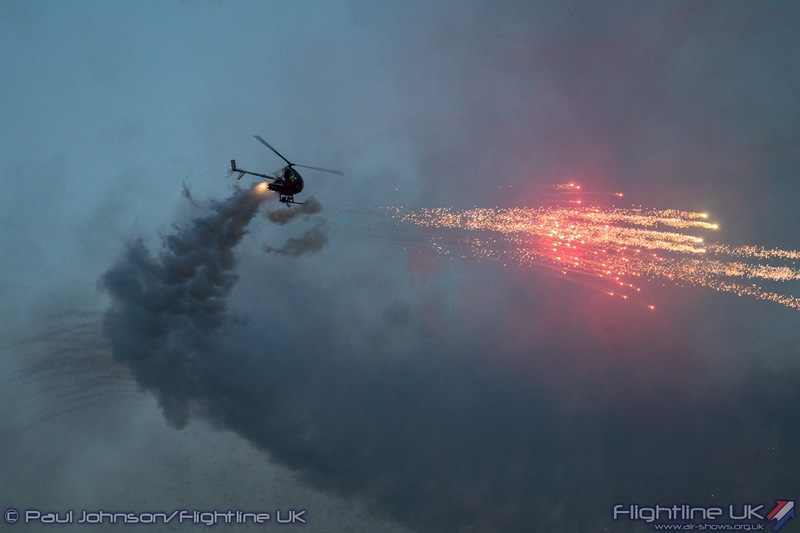 The evening was rounded off with a more traditional ground based fireworks display. 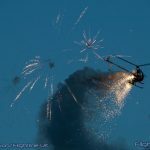 Thanks to some exceptionally warm weather, some really great flying and wonderful pyrotechnics the show was a wonderful, magical experience to kick-start the airshow weekend. 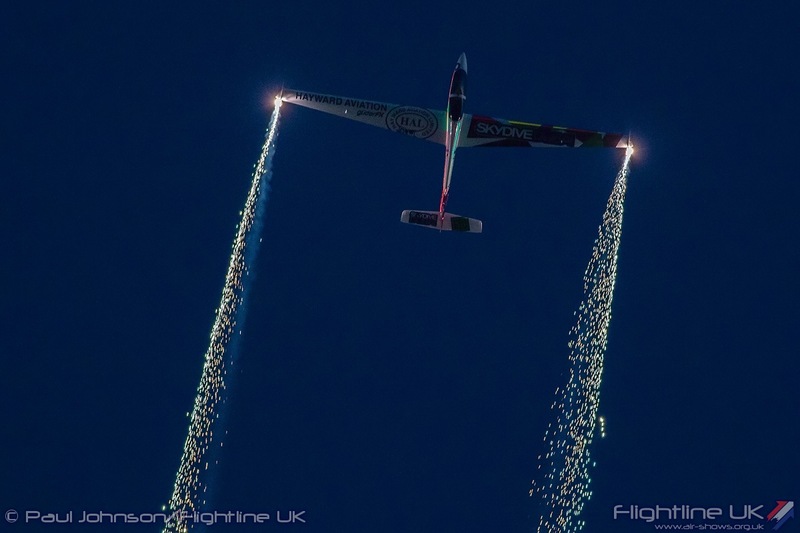 If you’ve not sampled the Sanicole Sunset Show, we thoroughly recommend a visit next year! 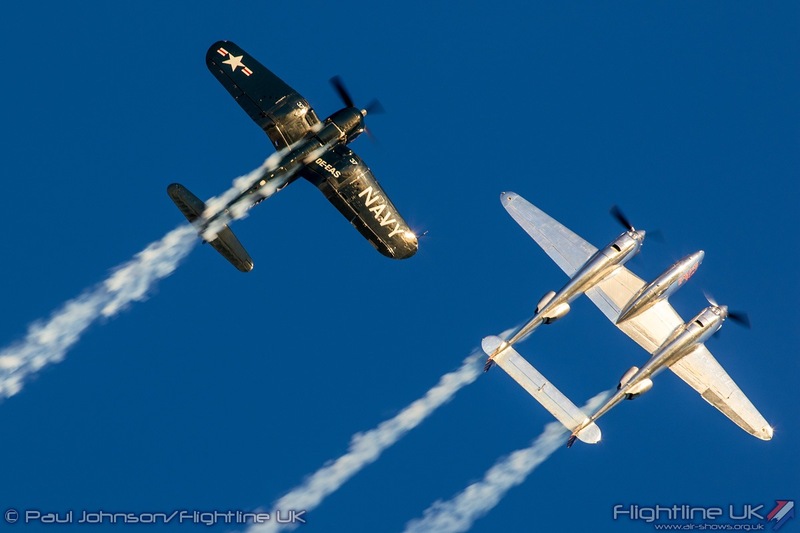 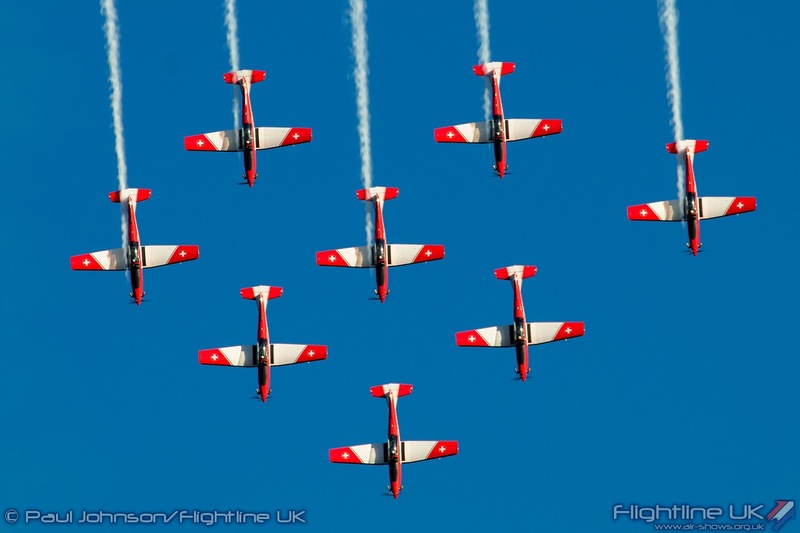 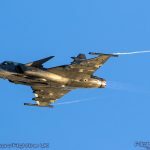 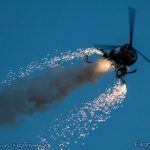 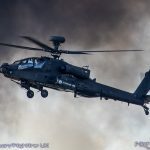 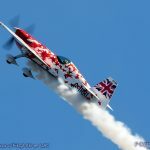 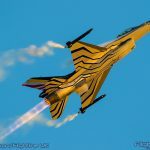 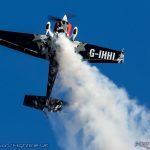 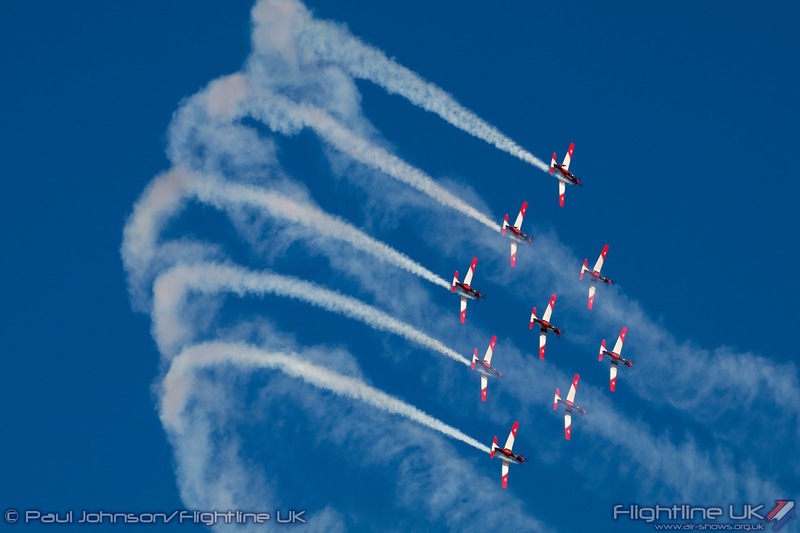 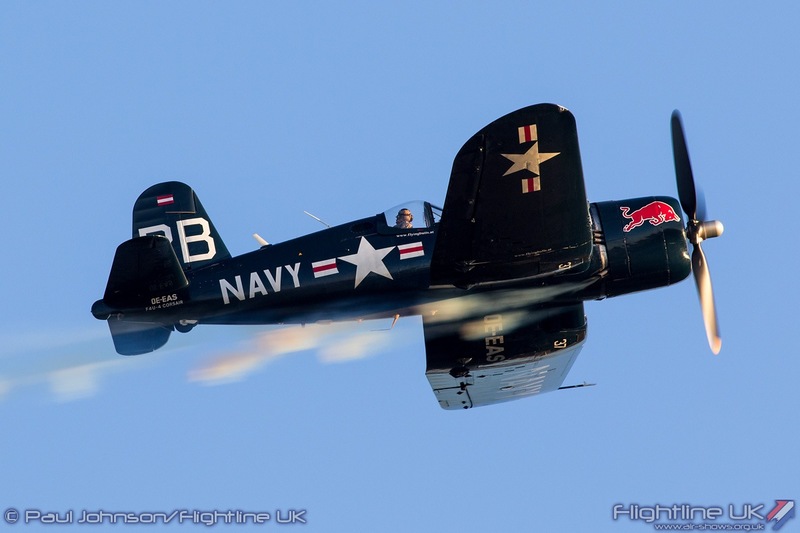 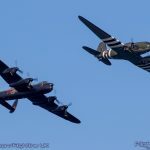 PreviousAIRSHOW NEWS: Air Tattoo DVD ready for Take off!